This back yard is on a south facing slope with five large oak trees. Access pathways and stairs are made with urbanite, (reused Concrete), with base rock as a foundation topped off with decomposed granite. The down spouts are directed into a rain garden flowing gracefully across the yard. Mostly drought tolerant California natives are planted along the slope. 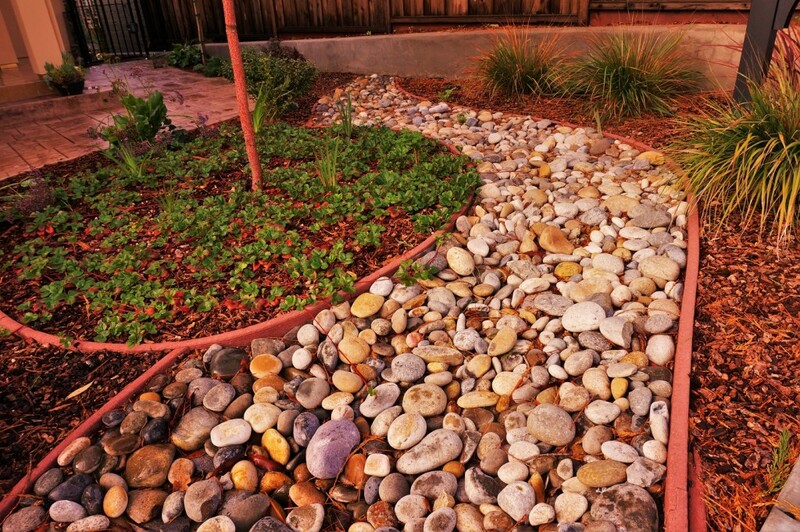 There is a river pebble patio with an urbanite retaining wall on the upward side. There are two 8 foot by 4 foot raised beds also made with urbanite. There is a home orchard with a dozen apples, persimmons and figs. The pathways, the raised beds and all the plantings are gopher wire protected and all plantings are on drip irrigation with a weather based smart timer. Last but not least at the bottom of the property there is a Hugelkultur bed. (Hügelkultur is a horticultural technique where a mound constructed from decaying wood debris and other compostable biomass plant materials is later planted as a raised bed.) The whole landscape is sheet mulched with cardboard and Mahogany Wonder Mulch. Vegetables in raised beds and vines/herbs are watered from a washing machine. Chickens weed the where the lawn used to be. Sonia and Tony love their garden, the joy it brings to them is immense. 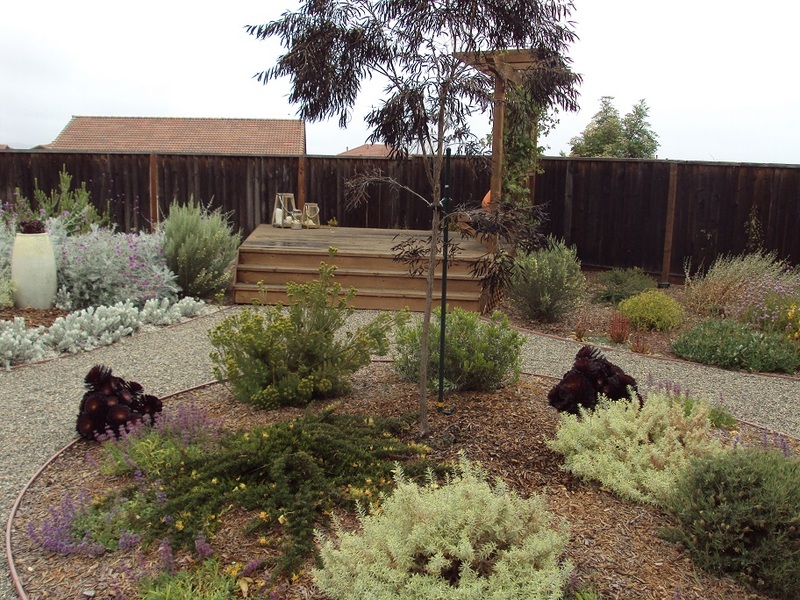 In 2016 Karen started the process of converting her turf landscape into a drought-tolerant garden. During the winter, she killed the grass by physically blocking sunlight and water. 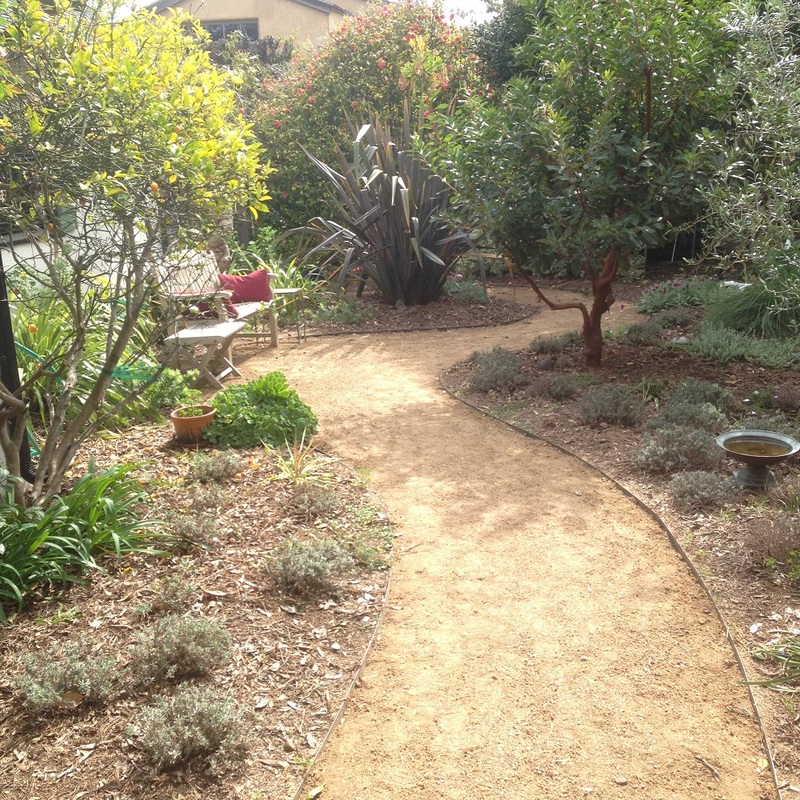 After removing the turf, she planted California native and Mediterranean plants and trenched her drip irrigation lines. She then covered the landscape with 5 inches of mulch. Over time some trees have been removed to reduce crowding. In 2017, the garden took off with the winter rain. Karen also has used integrated pest management to resolve pest problems as her garden established. In 2017, thrips attacked her rhododendrons which nearly killed her lower garden. By spreading diatomaceous earth around the root systems of her plants and spraying the infected leaves with neem oil, she saved her rhododendrons. 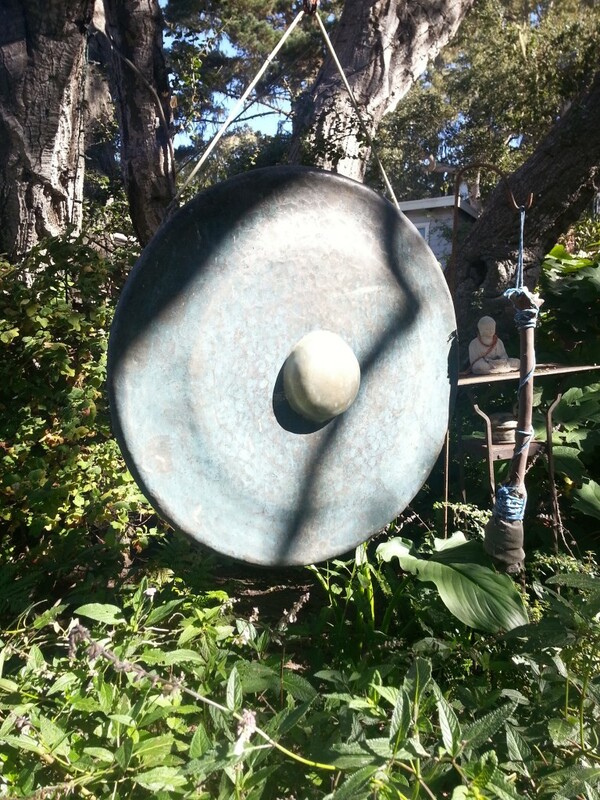 Karen's garden is situated in a shaded redwood forest which is prone to mildew and deer damage. By watering in the morning and selecting plants that are not an ideal food for deer, her garden thrives in its' redwood understory microclimate. 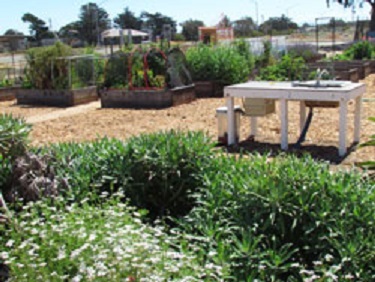 The Santa Cruz High School Garden allows students to experience land stewardship in a shared community site. With the help of Global Student Embassy, students participate in learning ecological landscaping skills while contributing to improving the school's curb appeal. The students have used mulch as a weed suppressant which also increases carbon within the landscape. Increasing the organic matter within the soil helps to improve the soils moisture capacity. Also, the mulch reduces the amount of soil moisture loss from evaporation. With the help of a workshop facilitated by Global Student Embassy and Ecology Action, the students learned irrigation design and implemented a drip irrigation system for their garden. By using drip irrigation water is used more efficiently. The slow release of water over time allows plants to take up more water than the same quantity over a shorter period. Drip irrigation also water loss from evaporation. 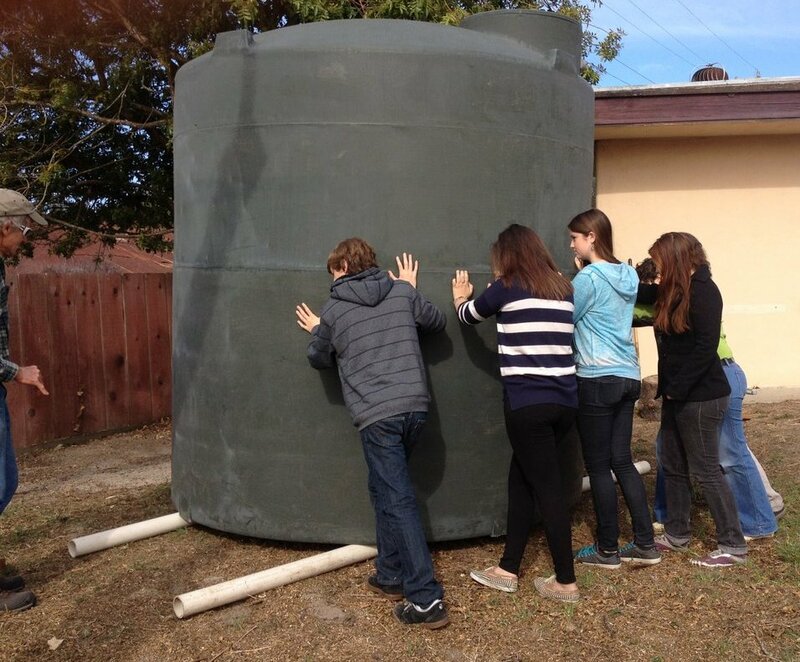 The school also received a donation from watermark for five fifty-gallon rain barrels. The garden harvests stormwater and repurposes the water to irrigate the garden during the summer and fall. The Natural History Museum is located near Seabright Beach in Santa Cruz. From dog walkers to students at the nearby schools the Natural History Museum offers something for everyone. 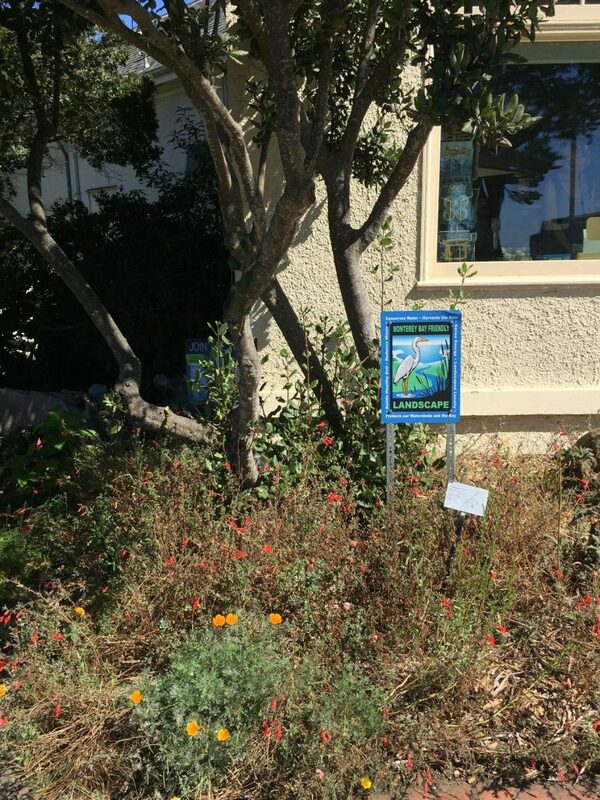 Centered around education and land stewardship the museum works to plant drought-tolerant flowering natives which provide an aesthetic appeal and serve ecology functions like protecting our local watershed and attracting beneficial pollinators. Perennials like Vert’s California fuchsia which thrive in costal climates brighten up the landscape while helping to create a functional ecosystem. The 5,000 square foot landscape around the building is watered with drip irrigation and harvests water using rain barrels. This area also has a bioswale to allow roof water to infiltrate into the ground before flowing into Pilkington Creek, where the museum has worked to restore the natural habitat. The creek serves as a visual example of what a natural California creek may have looked like before European exposure. The garden offers visitors the opportunity to see native drought tolerant insectary plants as well as different culturally significant plants such as willow and tulle. With the help of the Earth Steward program, local students have been able to learn valuable skills of landscape management while being exposed to the ecological landscaping skills like sheet mulching and protecting native species. The garden allows for an educational experience for all age levels allowing the museum to offer tours ranging from watershed protection to wildlife exposure, all the while helping to make Santa Cruz more drought resilient. What are new home owners to do with a yard full of sand for soil? 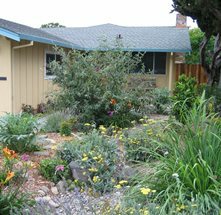 Karin and Scott Stratton didn’t want to fight Mother Nature and instead chose to work alongside her by replacing their flat, boring, water-intensive front lawn with a dynamic landscape of California native plants. Why? 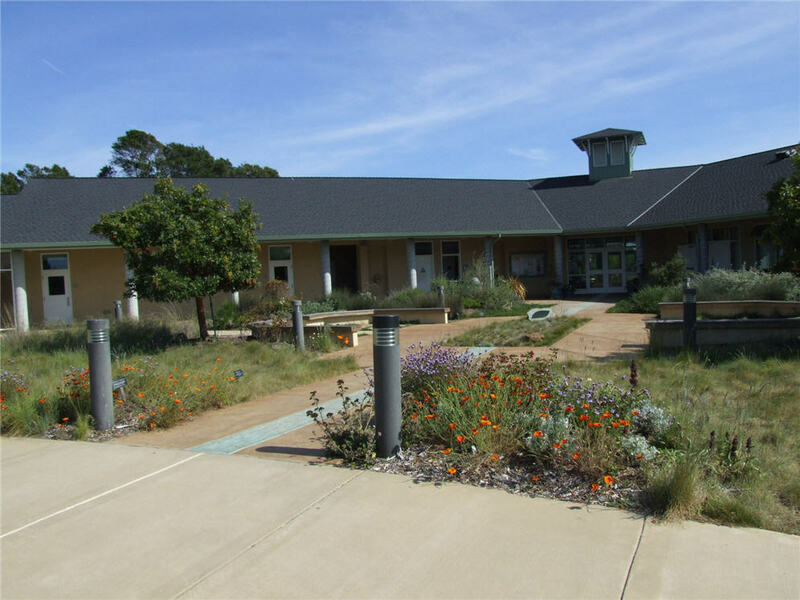 Water conservation, habitat restoration, wildlife refuge and the downright beauty of CA natives-which Karin had learned about in a Green Gardener Certification class at the Monterey Adult School. Their inspiration? Monterey Bay Aquarium’s Sandy Sea Shore & Aviary exhibit where the ocean tides meet the sand. A walk through the Aquarium’s aviary not only showcases the diverse coastal birds of our region, it also highlights the amazing plants that survive and thrive in a sand rich environment. 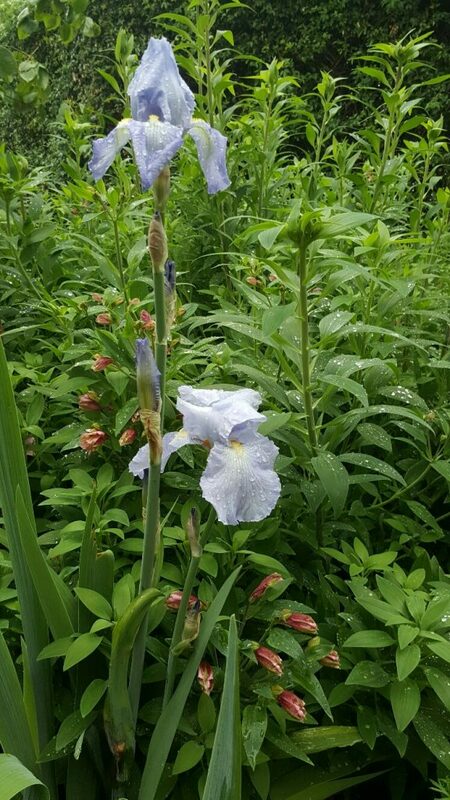 With the installation of a drip irrigation system in their yard, the Strattons were pleasantly surprised to see that it really didn’t take long for the plants to become established. A side bonus, wildlife is naturally attracted to the Stratton’s native landscape and they very much enjoy seeing birds, butterflies and bees make themselves at home. 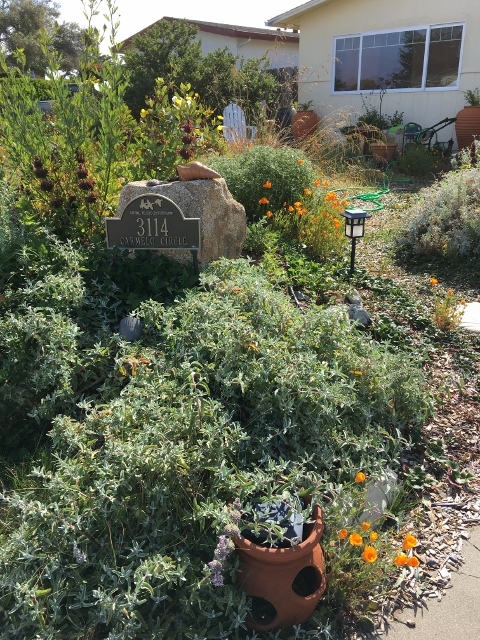 In fact, thanks to several bird baths in the yard, protected areas for nest building and young rearing as well as sustainable garden practices, their yard has been assessed as a Monterey Bay Friendly Landscape as well as a National Wildlife Federation Certified Wildlife Habitat® (see both plaques in their yard). Their favorite native? That would be the ceanothus, or California lilac, of which you will see several different species of ground cover, bush and tree forms showcased in their yard. Karin loves the periwinkle color of the blooms which are usually in full force during her early March birthday. When not in bloom, you can see the same color adorning the Stratton’s front door. In addition, the Stratton’s are also avid composters and reap the benefits of both their worm ranch and spinning composter. Scott and Karin now have a deep appreciation for a native landscape and hope that others will be inspired to lose their lawns and go native! El Dorado Park was originally designed with a two concrete lined ponds, connected with a concrete-lined stream. In 2014, this once beautiful and water-intensive infrastructure was in disrepair and was a community eyesore that collected irrigation run-off and mosquitoes. With Prop 84 funding from the State Water Resources Control Board, Ecology Action developed a vision with Fall Creek Engineering and the City of Salinas to convert these concrete ponds into permeable bioretetion areas. Stormwater run-off from El Dorado St and the Park's parking lot are now diverted into beautiful bioretention areas planted with native plants. This project now infiltrates 1.53-acre feet of stormwater into the Salinas aquifer and won the 2018 APWA Public Works project of the year award. Nick's garden reflects the influence of Alan Chadwick. Storm water is harvested with from downspouts with five-gallon buckets during the winter which is then transferred into 50-gallon cisterns. By using drought tolerant crops these 50-gallon cisterns water the garden into late July. Organic matter is added to the soil using compost and cover crops adding nutrients and increasing water retention. Nick also cultivates dry farm tomatoes which pull water from the deeper water profile. 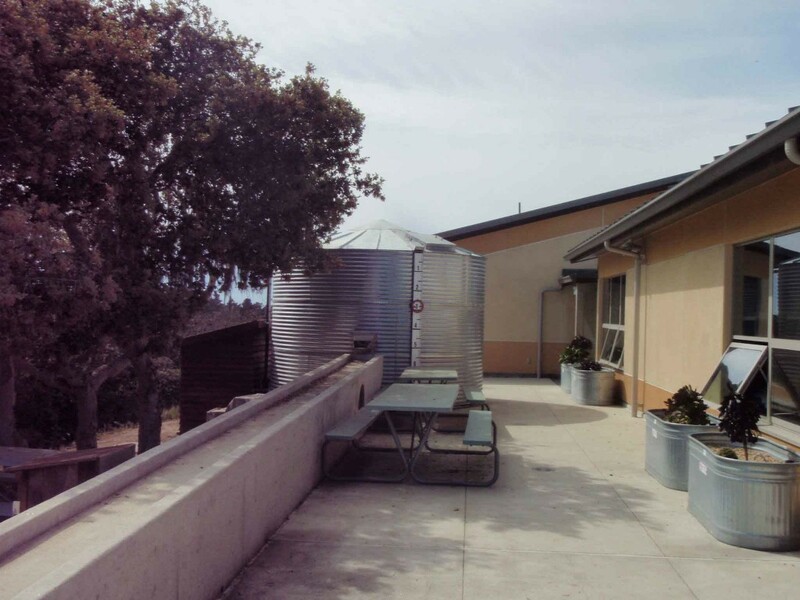 The Natural Bridges High School was outfitted with two 4,000 gallon storm water cisterns. WIth the help of Ecology Action and the IDEASS program at University of California Santa Cruz stormwater will now be harvested and irrigate an apple orchard within the garden. Overflow from the cisterns will drain into permeable gravel which will help water infiltrate into the soil. Before Michael transformed his landscape into the Monterey Bay Friendly site, the area was covered with Ivy. After removing the invasive species by hand Michael went to work planting drought tolerant native plants and setting up drip irrigation. The hillside also is irritated by stormwater harvested from various downspouts around the property which drain into rain barrels. The harvested stormwater is hand watered both during the summer and in between storms. With the help of volunteers from a lose your lawn workshop on April 15th, the Emeline park was transformed into a low maintenance water efficient landscape. Volunteers sheet mulched the 3,100ft2 park to increase soil organic matter. The west side of the landscape has a curb cut to allow water to flow from the sidewalk into the landscape and infiltrate back into the soil. 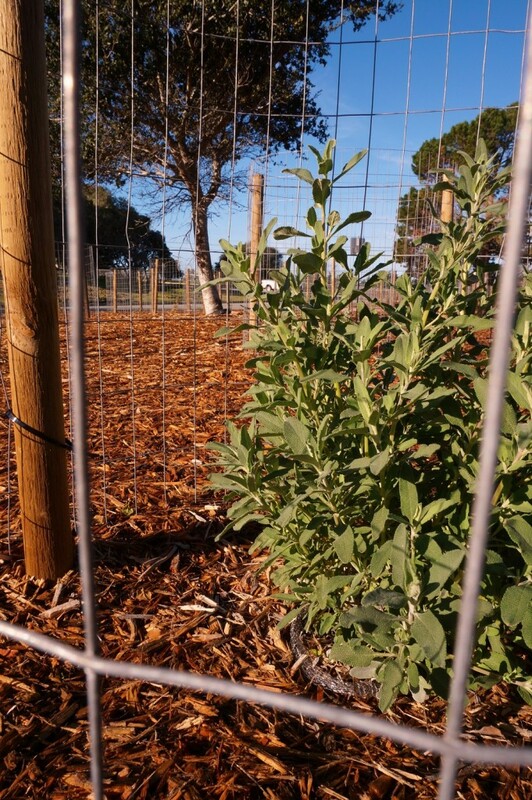 In addition, drip irrigation was set by Ecology Action and the Santa Cruz Park department to reduce water use. On May 21, 2016, Ecology Action, Patagonia and the Water Conservation Coalition of Santa Cruz County sponsored a Lose-Your Lawn Workshop. 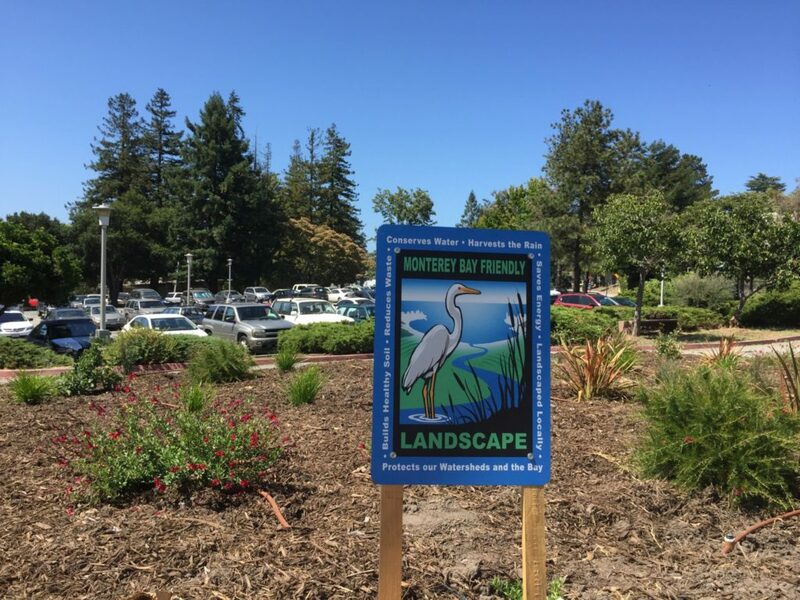 This free community workshop resulted in the replacement of 1,200 ft2 of lawn at Santa Cruz City Hall with a beautiful Monterey Bay Friendly Landscape. This landscape will inspire the public and visitors to City Hall to harvest the rain and renovate their thirsty landscapes with low-water use plant selections. The lawn was rennovated with the sheet mulching method, which conserves carbon and soil organic matter by eliminating trips to the landfill. 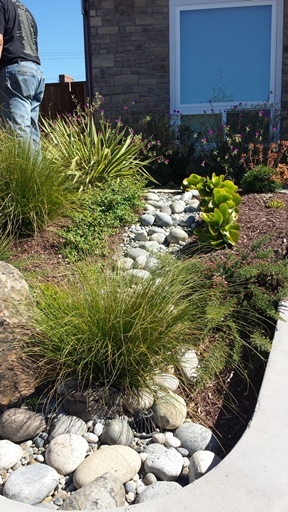 As part of the RainScape Rebate Program, a front corner planter area at the Pacific Grove Natural History Museum was redesigned to incorporate a demonstration of low impact development landscapes. There was an opportunity to tell a story about how a raindrop travels from the sky, on the museum rooftop, through the landscape, into underground stormwater pipes, and eventually to the Monterey Bay National Marine Sanctuary. Museum roof downspouts were disconnected routed to a flow-through planter and rain garden. The flow-through planter accepts water from the downspout which then slows and cleans the water with a combination of bio-retention soil mix and plant root systems. 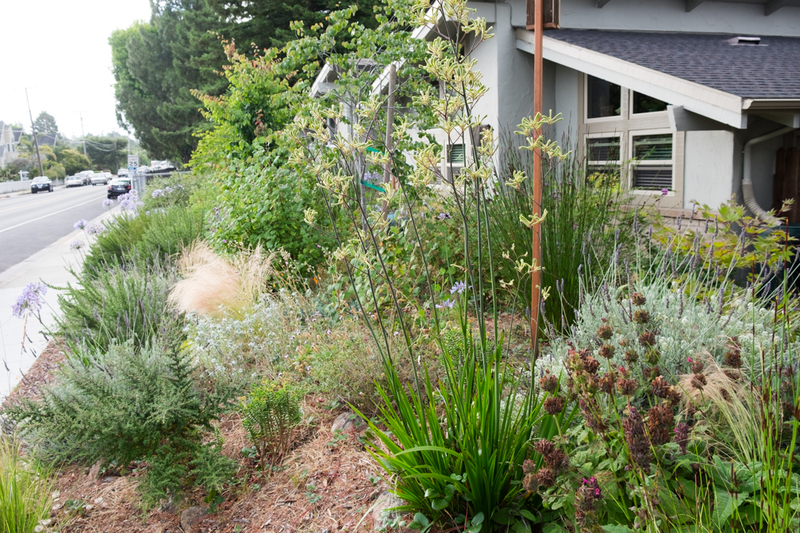 When the water level reaches capacity in the planter, it flows into a created rain garden. The rain garden is a depressed and planted landscape feature, which accepts roof rainwater from the adjacent flow-through planter. Overflow will be routed to an adjacent storm drain. 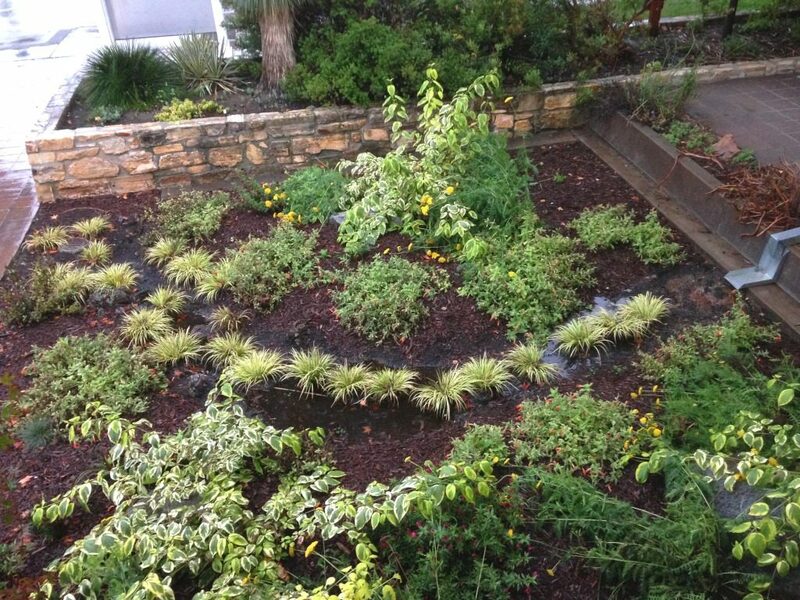 With the help of adding organic compost amendment to the rain garden and mulch later, more stormwater is retained. In addition, only California Coastal plants were planted which are beneficial for habitat and pollinating species. 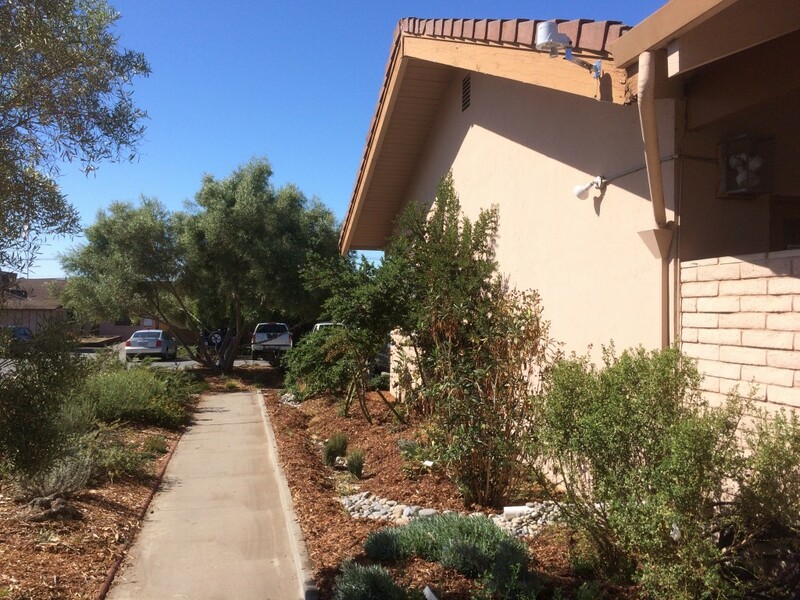 These homeowner's wanted to create a landscape that was drought tolerant, easy to maintain, and aesthetically pleasing. It all started in 1996 when the Dominican Hospital of Dignity Health created their Landscape program to create gardens throughout the hospital to allow patients and visiting family and friends a space to reconnect with nature. One garden is the “Meditation Garden,” installed in 2000, that encourages people to step into the outdoors and relax, soon to be converted into an outdoor rehabilitation space. Sister Mary Ellen, along with the Dominican staff wanted to use ecology to represent the relationships that the hospital was practicing through food, health and recycling. 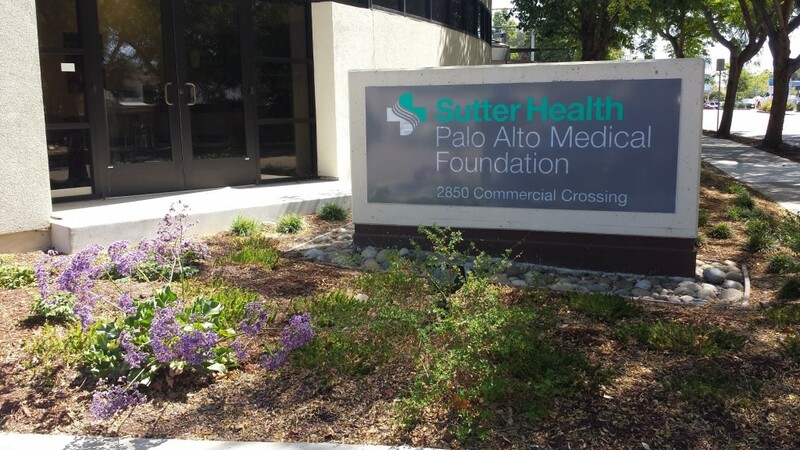 In 1997, Dignity Health created the program Practice Green Health, a networking system to help each organization improve its environmental performance. Throughout the years, Dominican Hospital has converted 40% of the landscape into drip irrigation across the 12 acres of landscape and converted 5 grass lawns into Native landscaping only keeping the one lawn near the main entrance. This past year (2015), Dominican Hospital saved 57% of their landscaping water usage compared to previous years while generating 2-to-3 thousand pounds of fresh produce to use in the hospital kitchens that is grown on-site in the food garden. Dominican Hospital is implementing many landscape water conservation practices while providing a healthy habitat for the patient's, family and friends creating an atmosphere to heal. This mature permaculture site has 29 fruit trees, 11 vegetable beds, a fishpond and 2 beehives.Trees are minimally pruned and were originally planted to accommodate their mature size. Lawn was removed and greywater and rainwater harvesting systems installed. All stormwater and yard trimmings (plus kitchen scraps from 3 neighboring households) are retained onsite, producing compost and helping to retain moisture in the soil. Seeds are propagated in a 6x6 pop-up greenhouse and organic produce from the site (fruit, vegetables, honey, seedlings and other plants) are sold curbside. A Little Library and a Poetry Box also draw neighbors to the site and create community..
Terra Nova removed the driveway concrete from the side fence back. Then reused the concrete to build 'Urbanite' patio and walkways. 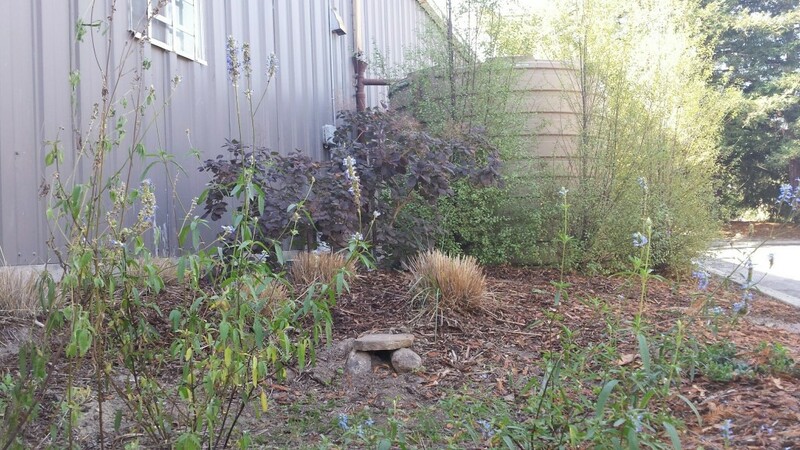 They installed a native grass meadow, a laundry to landscape graywater system, a drip system, edible landscaping, a keyhole raised garden bed and a rainwater catchment system. Using mulch and compost to build healthy soil. Growing drought tolerant and California Native Plants. Practice natural pruning and plant spacing. Replaced spray irrigation with drip irrigation. Removed 720 SF of non-permeable concrete. Directed 1719 SF of impervious roof area to a dry creek bed. Disconnected 5 downspouts and direct rain to tanks and cisterns collecting 695 gallons. Grow vegetables in a raised keyhole garden bed. Installed a laundry to landscape system to feed front yard's 8 fruit trees. Reused concrete pieces to create permeable pathways and patio. 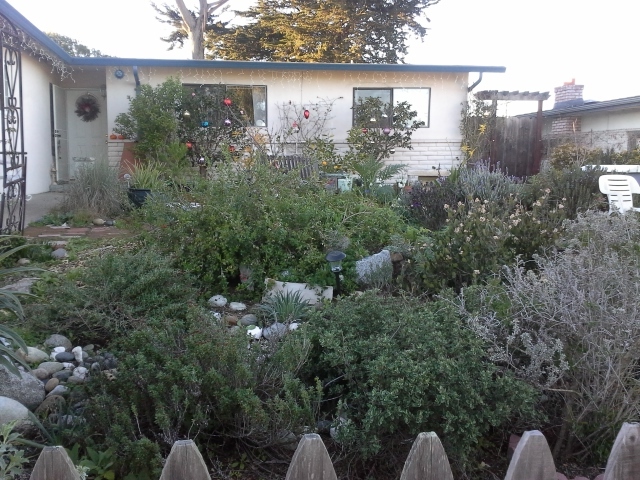 Replaced front yard lawn with food forest, made of herbs and fruit trees. Planted native sedge meadow. Designed as play space for kids and dogs. Built a worm bin to compost food and plant waste. Practice non-toxic pest control methods. Provide wildlife habitat with native plants and flowers. This is a gorgeous site in Pacific Grove with an ocean view. The plant palette was chosen very specifically to be deer-resistant, tolerant of ocean conditions and quite shade tolerant since the site is dominated by large, mature oak trees. My objectives in plant selection was to focus almost entirely California native oak woodland plant selections and create a gorgeous, thriving habitat garden for pollinators and wildlife. This garden began as a weedy, sandy lot with a dead lawn and one blighted fruit tree. Twenty years and many cubic yards of home compost and mulch later, the soil now supports an eclectic mix of natives, Mediterranean and succulents, pollinator supporting and edible plants. The coastal oaks planted as one gallon seedlings—now taller than the house—happily grow with no additional water. Raised food garden beds were built with urbanite up-cycled from a concrete pathway demolition. Rain collection capacity is currently at over 1,000 gallons and all the roof water is utilized to deep soak the fruit trees during the rains. The diverse flowering plantings supplement the forage of the back-yard honey bee apiary all throughout the year. This home had an asphalt driveway and side yard that was creating stormwater run-off to Granite Creek. 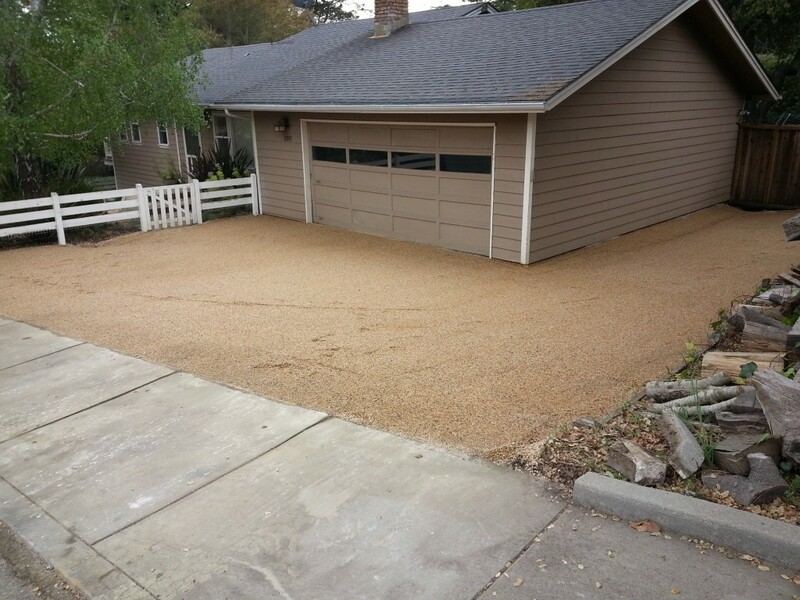 The owners removed the asphalt and substituted with base rock and California Gold gravel to provide 1200 square feet of pervious surface to their adjacent low-water landscape. 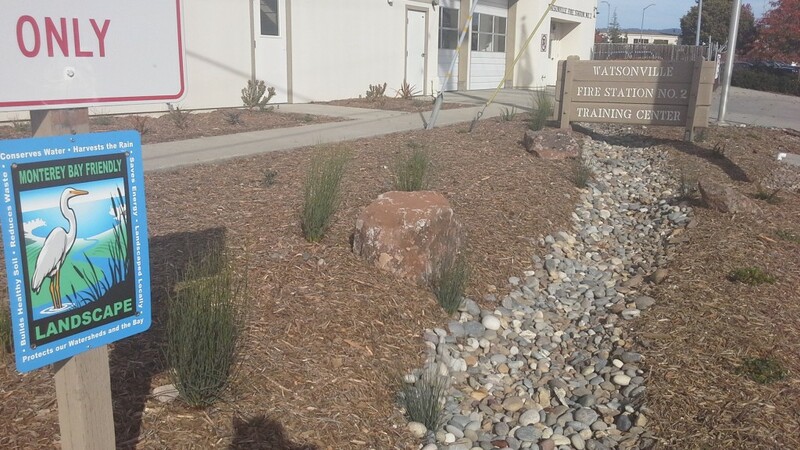 The California Conservation Corps teamed with the City of Watsonville to transform the old, neglected, sprinkler irrigated landscape into a beautiful, drought-tolerant demonstration garden. 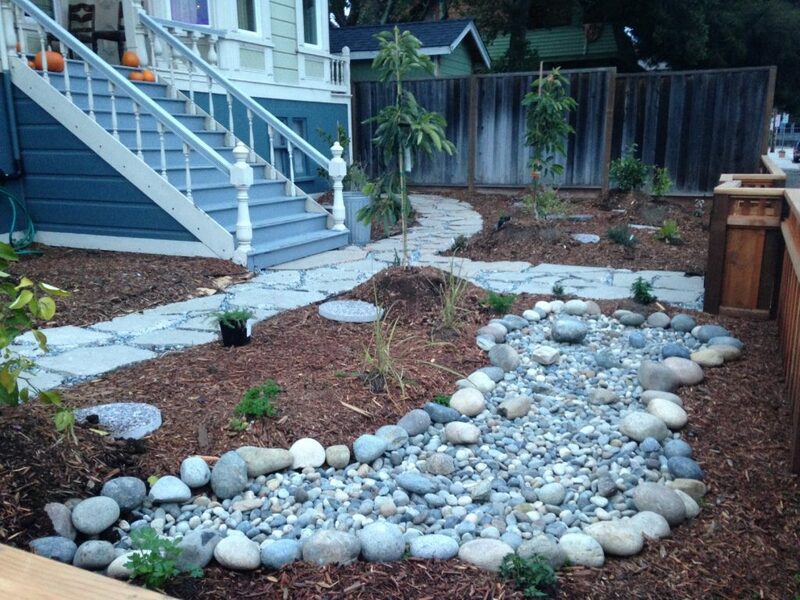 Another thirsty, high-maintenance lawn replaced with beautiful drought-tolerant plants and dry creek bed feature. Inspired by the drought, The Inner Light Ministries Church began to redesign the children’s garden to be a water neutral garden in 2013. This 4500 square foot garden features a sustainable lawn of native coastal bent grass (Agrostis pallens) for a play area that is shaped as an infiltration basin. It receives sub surface drip from the 3000 gallon rain tank and only needs to be watered once a month. Love’s Gardens, a landscape company focused on environmental sustainability, volunteers to maintain the children’s playground with family volunteers. Golden Love calculated the amount of rainwater that could be collected from the 1600 square foot section of roof and acquired a 3000 gallon rain tank to water the new lawn, the children’s veggie garden, and the fruiting vines and trees. 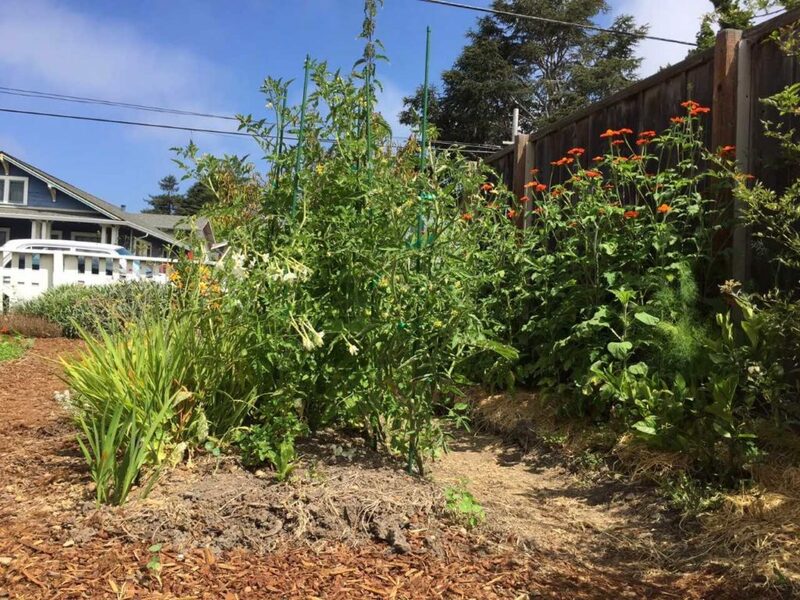 The garden redesign qualified for Soquel Creek Water District conservation rebates and local companies gave discounts on supplies to make the project affordable. By the conclusion of the project, Inner Light will have received over $2000 in rebates to offset much of the cost of the garden project. The garden was envisioned, coordinated and designed by Orsolya Salzberg, Reverend Beth Love and Golden Love among many other visionaries and volunteers. The children at the church also helped make it happen from digging, planting, mulching and moving the rain tank into place. This is truly a community garden that uses very little municipal water. Landscape Designed ByU.S. Army Corps of Engineers & Ecological Concerns, Inc.
Landscape Maintained ByEcological Concerns, Inc. This chapel, as part of the Monterey Presidio, features a landscape with drought tolerant native California plants and recycled wood mulch. The passive drip irrigation system reduces overall water consumption and utilizes reclaimed water as it's primary water source. The downspouts for the roof drain into rock bioretention areas that surround the building. The U.S. Army Corp of Engineers designed a passive irrigation system for their Federal Building in Seaside. It features a lawn area in the middle of a hill that drains to outfalls of areas surrounding the lawn. 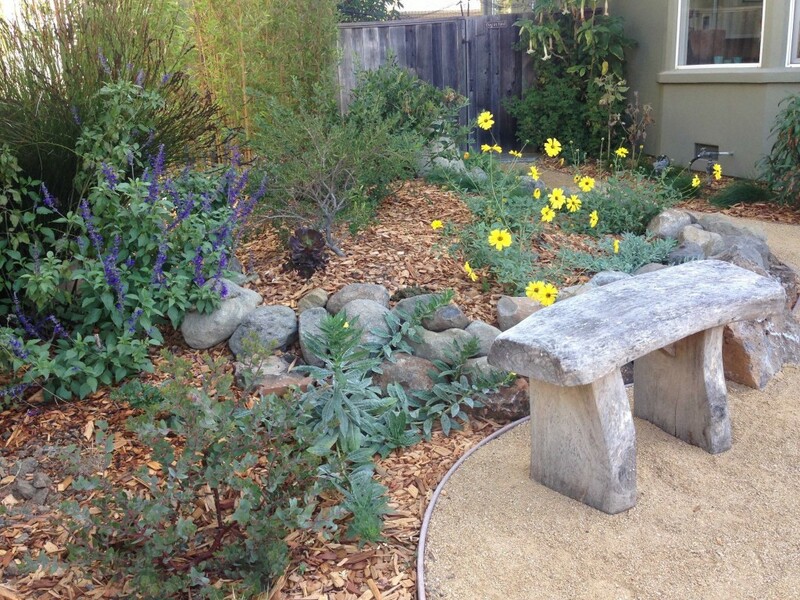 This xeriscape project also features plants native to California, and the mulch is made from recycled wood. Irrigation is supplied by a drip system that uses reclaimed water. Landscape designer's own home. 3,000 square feet of non-functional turf was removed and replaced with drought-tolerant plants from various Mediterranean regions of the world including Australia, New Zealand and South Africa. I primarily experiment with plants that I want to learn more about, so my landscape is more random and naturalistic than many of the projects that I design for clients. Because I have many different gorgeous plants that bloom during all times of the year, I attract many birds, pollinators and insects. My garden is literally buzzing all the time. I have many succulents and two different types of walkable grass alternatives - Dymondia margaretae and Lippia nodiflora. The Shoreline/Goodwill Garden supports marginalized people in gaining access to fresh, local, organic produce. The garden features include composting systems, a fog catcher, and a hügelculture display surrounded by native/drought tolerant landscaping. The garden is a partnership lead by Everyone’s Harvest involving five other nonprofits: 1) Goodwill of the Central Coast culinary job-training program working with individuals with barriers to employment, 2) Hope Services working with adults with developmental disabilities, 3) Marina Tree and Garden Club working with local resident members, 4) Community Hospital of Monterey Peninsula Wellness Center working with staff, and 5) Veterans Transition Center working with veterans dealing with mental health issues, physical disabilities, and transitioning from homelessness to self-sufficiency. Mark & Paula Fisler purchased their family home on Max Circle in 2008. After moving in they began watering the sod that was installed by the previous owners. After a year of frustration and wasted water, the Fislers had gutters installed directing the roof runoff rain water into collection containers. 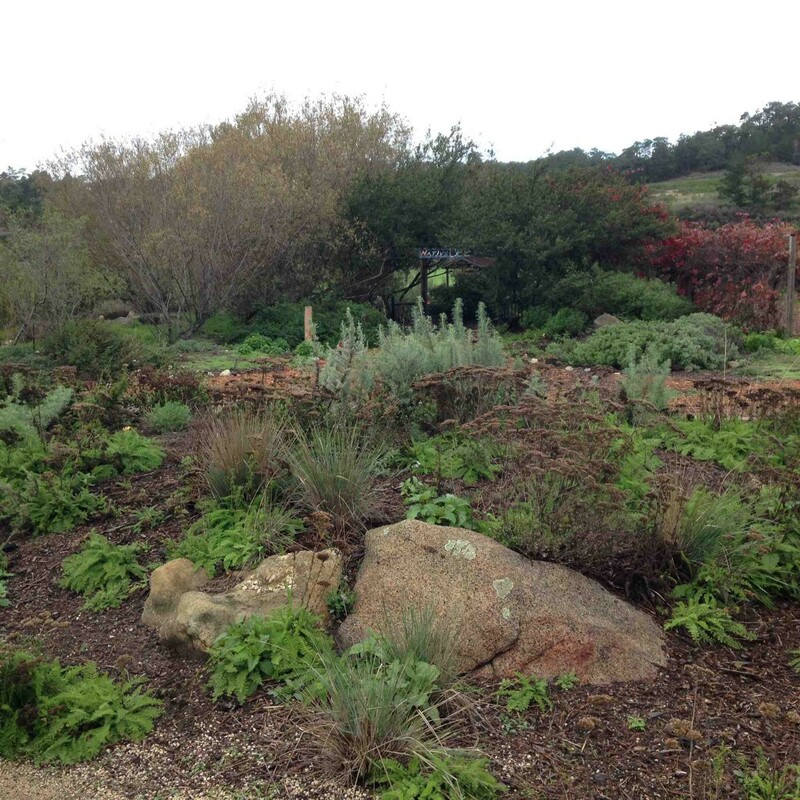 From there the Fislers redesigned their landscape to focus on a mix of edibles and drought tolerant plants. All of the sod was either dug up and piled for use as mounds or covered over with cardboard and wood chips to create pathways and sitting areas. Raised beds were built for annual vegetables and ground level beds for fruit trees. 95% of all watering is done by hand, using rainwater and applied only to new plantings and edibles. 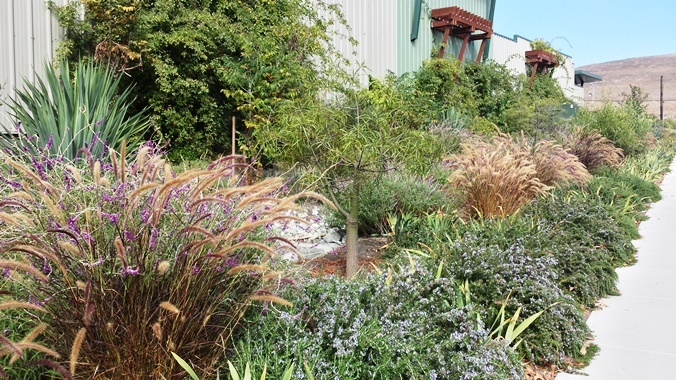 70% of the landscape is planted with drought tolerant and native plants only receiving water naturally via rain. 1,600 gallons of rain water can be harvested and contained for future use, though much more is collected during the rainy seasons, as it is continually used for deep watering as the catchment containers fill to capacity. Landscape Designed BySSA Landscape Architects, Inc. The Heart of Soquel Plaza Park is located along Soquel Creek, with a significant portion of the project site within a designated riparian corridor. The project was an excellent opportunity to demonstrate how passive recreation, and sustainable design principles are not mutually exclusive in a public open space. The project implemented rain gardens, pervious concrete, permeable pavers, and impervious areas that drain directly to the landscape. 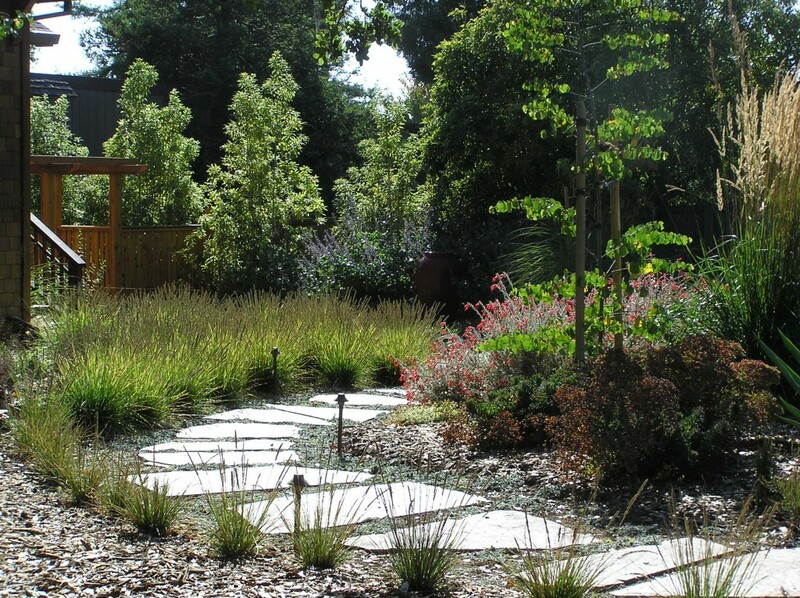 The plant palette was comprised of (mostly) native low to very low water use plants, as defined by the California Water Use Classification of Landscape Species (WUCOLS) and divided into the following areas: rain gardens, ornamentals and riparian restoration. Some showcase species include: Verbena bonariensis, Zauschneria californica, Festuca californica, and Ribes singuineum. This landscape surrounds the Cabrillo College Horticulture building’s classrooms and community room. It is on the top of a hill looking over the Monterey Bay and the Cabrillo College campus. 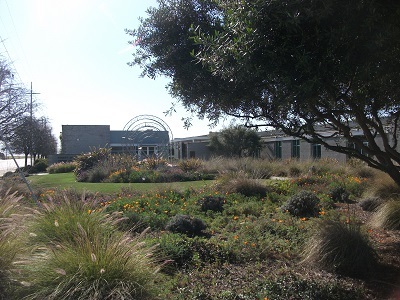 The landscape was installed in 2005 but is continually being developed as a demonstration landscape and offers space for students to learn about sustainable landscape design as part of the horticulture department at Cabrillo College. 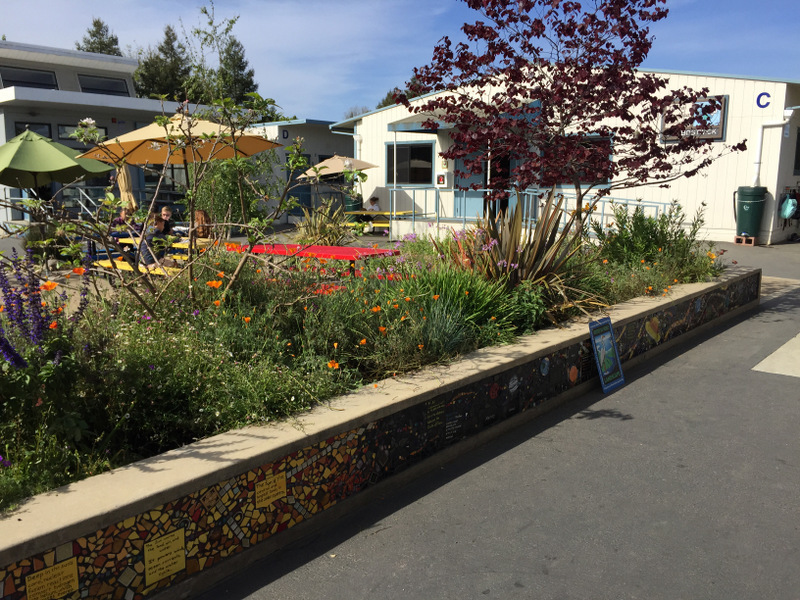 This garden features California native plants, three 4,995 gallon rain water tanks, a student-built cob bench, permeable pathways and drip irrigation. Landscape Designed ByEcological Concerns, Inc. The landscape for this residence has been recently updated. The front yard features two dry creeks, which are located on both sides of the driveway. They are surrounded by drought tolerant plants. 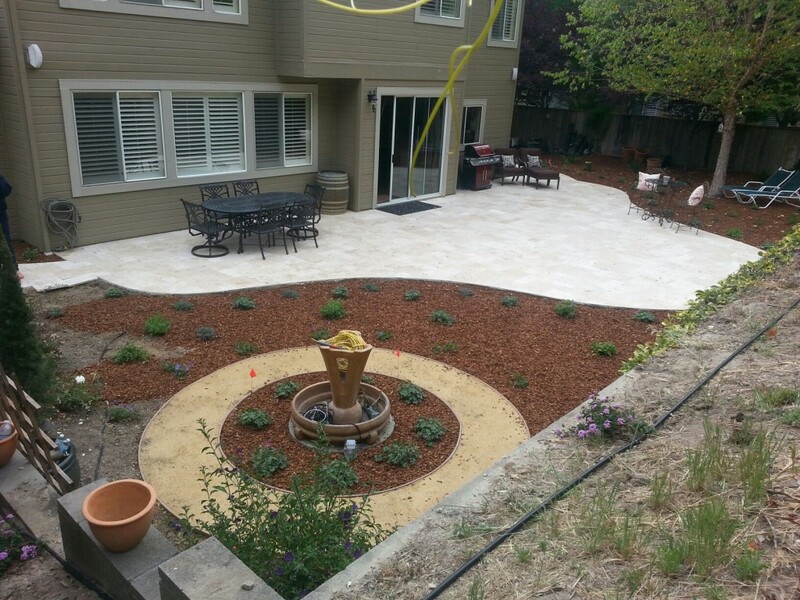 The backyard features a paver patio with pervious joints and drought tolerant plants. 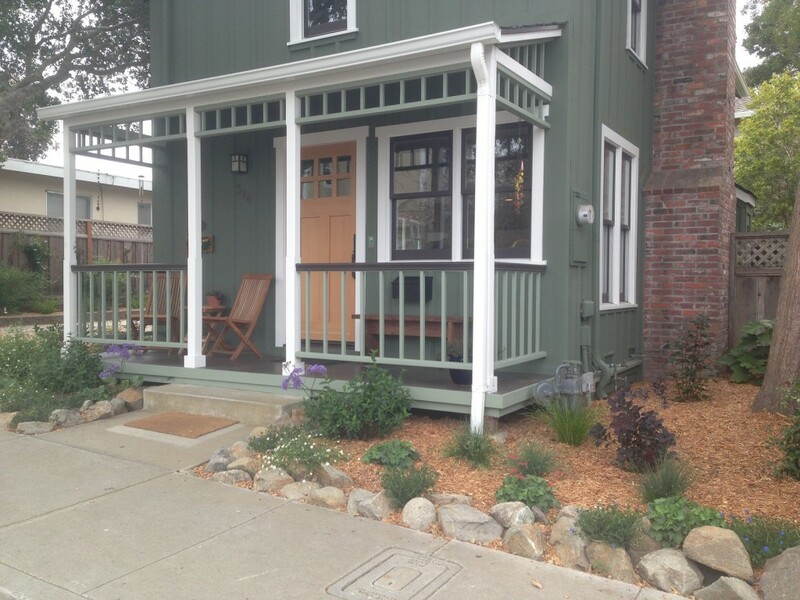 The hillside below the patio has been planted with all California native plants by Ecological Concerns in Santa Cruz. All plants are irrigated by drip tubing with emitters. 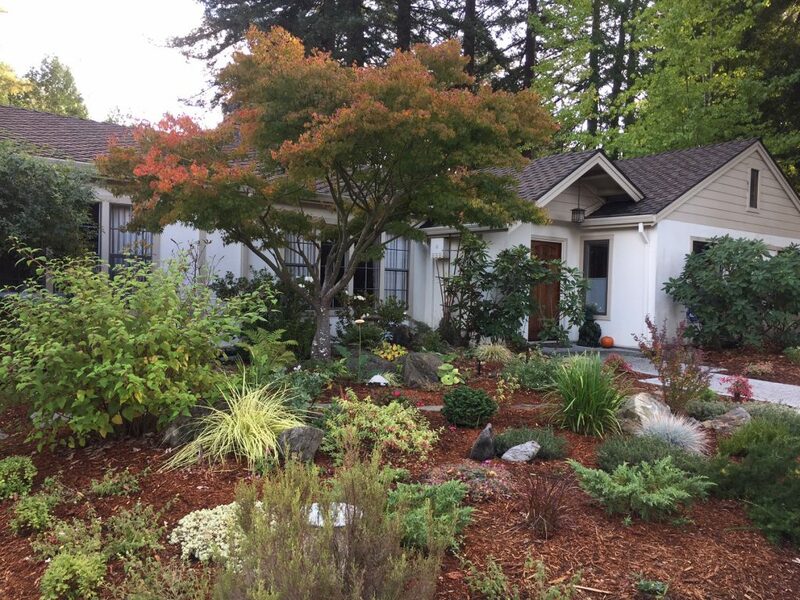 Mary is an awesome client and an enthusiastic proponent of all things ecological-landscaping. 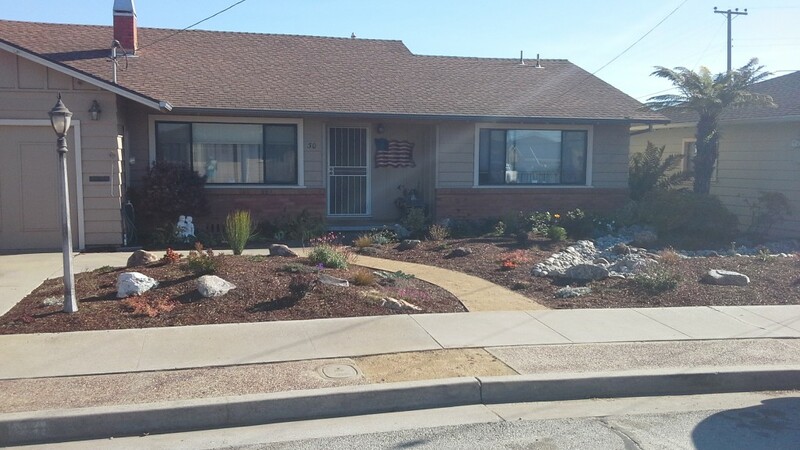 After attending my water-wise design class at Cabrillo Extension last summer, I designed an installed a beautiful perennial garden in the front of her home, removing 1,300 SF of non-functional turf. We recently began the design process for the back garden, once again removing 2,000 SF of dead lawn. Mary will receive the maximum turf removal rebate from Santa Cruz City Water two times in a row since the jobs were done in two calendar years. The design includes only the lowest of the low-water plants since Mary is very conscientious about household water use. 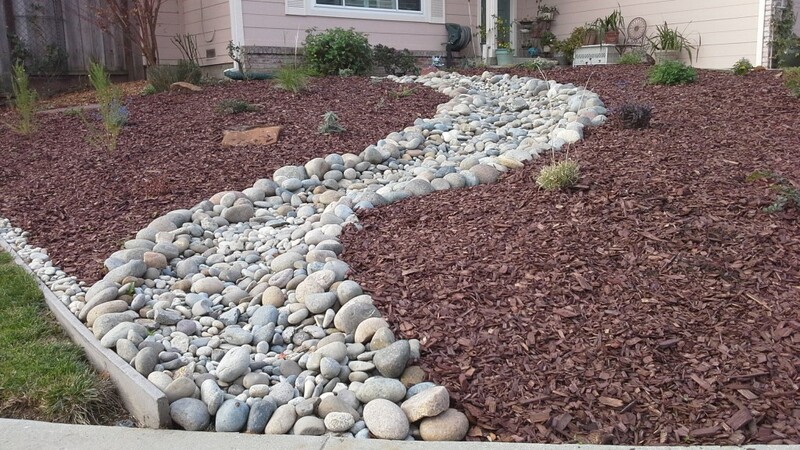 A large, curving dry creek bed with large Sonoma Fieldstone boulders is the main feature in the garden, diverting one of the major downspouts to groundwater recharge. Also included is a flagstone patio set in DG and large arbor to block the south-west facing sun at dinnertime. The garden also features several meandering pathways to access the raised veggie bed, along with a footbridge that crosses the dry creek. The community foundation leads the area in water conscious landscapes demonstrating the ability to design a beautiful landscape while maintaining values in water conservation. 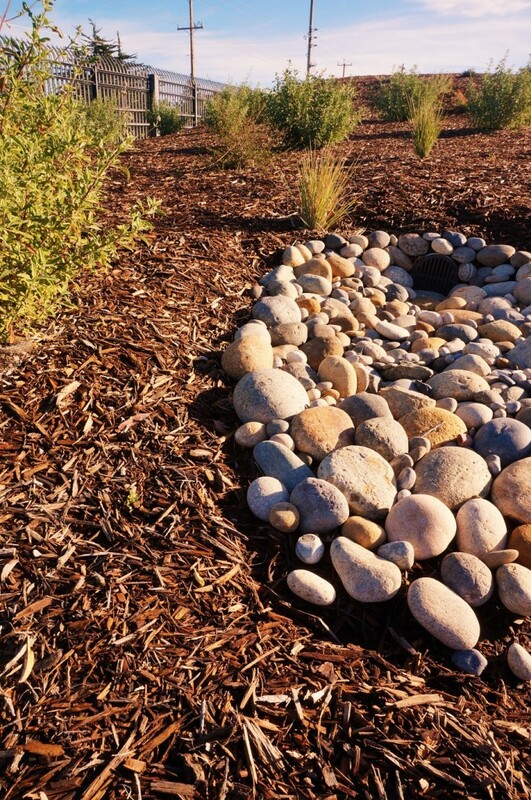 The 3,000 square foot landscape utilizes woodchip mulch, drought tolerant native plants, and drip irrigation. Downspouts drain storm water into permeable gravel to slow runoff and allow the water to sink into the soil. During the spring of 2015, Vintage Faith began altering the landscape in front of the church to better fit in with the goals they set. These goals included the creation of a low-water landscape that is eye-catching and beautiful. The landscape originally featured fruit trees like pear and apple, but these turned out to be inappropriate for the landscape. These trees were donated to Mesa Verde Gardens, who helps create organic community gardens to promote food security with families in Pajaro Valley. 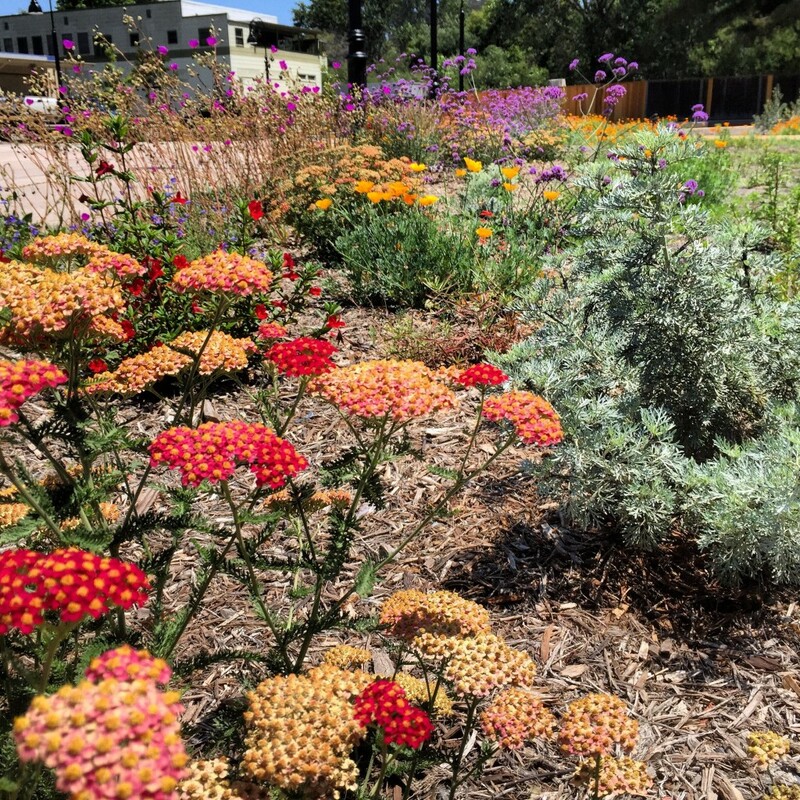 In order to transform the landscape, Vintage Faith removed the invasives that were taking over the space and propagated the existing natives to create a drought-tolerant and native plant pallet. 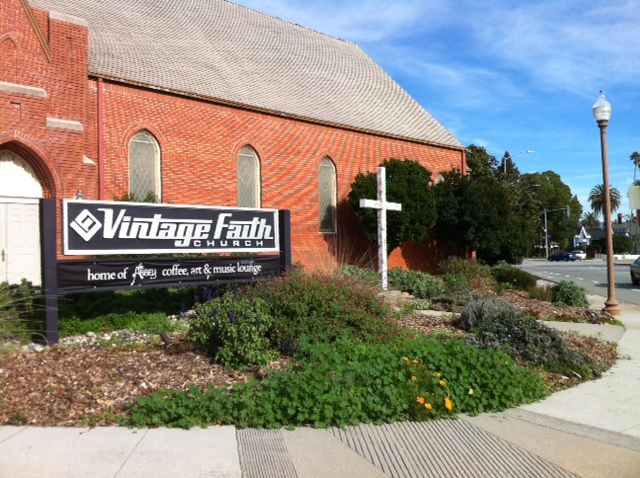 The initial mulch was donated by a congregation member, and with the help of the community the landscape outside Vintage Faith is now well-mulched, drought-tolerant, and beautiful. The church has experienced a decrease in (or complete disappearance of) weeds due to heavy mulching, and trash too, due to a new respect the community has for the amazing amount of volunteer work and thought put into making this landscape Monterey Bay Friendly. Plantronics is an international producer and distributor of communications technology with headquarters located in Santa Cruz, California and is dedicated to the ideas and goals of Global Citizenship. To Plantronics, being a global citizen means working towards building a sustainable workplace that conserves energy, water, and other resources that contribute to a more sustainable community. Plantronics is supporting local businesses like CityBlooms who provides lettuce and specialty greens for the company cafeteria. This microfarm is located on the company property so that the food produced there is eaten minutes after it is harvested, ensuring its freshness for Plantronics employees and cutting emissions that are usually created through food transportation. CityBlooms also uses a computer-controlled hydroponic system that is capable of growing 1000 plants using 75 gallons of water. The system also utilizes recycled water and energy produced by the Plantronics solar system making this collaboration a great way to support local sustainable businesses that contribute to an energy- and water-efficient community. 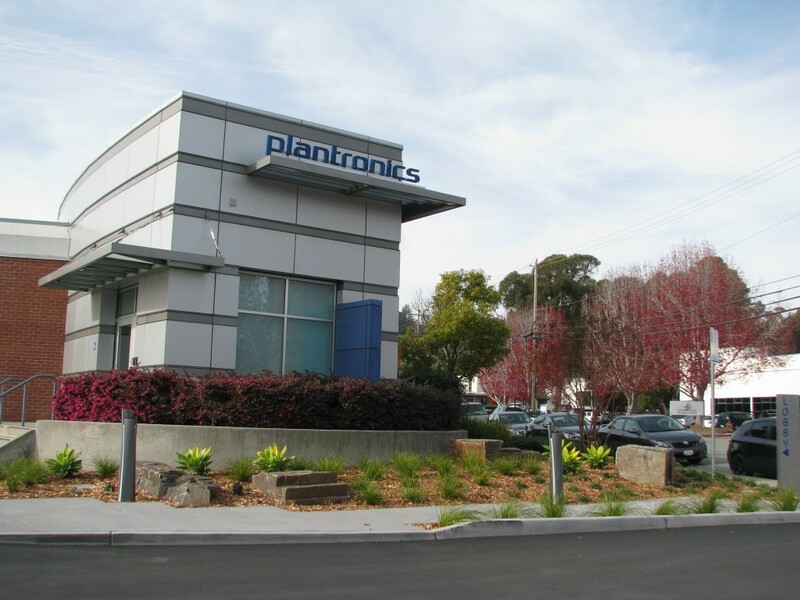 Plantronics is also helping to set a new standard in sustainable landscaping by installing and maintaining a Monterey Bay Friendly Landscape that will inspire others to follow. By using a “smart” irrigation controller that uses current weather data to apply water efficiently, planting drought-tolerant succulents, grasses and shrubs, and installing green infrastructure such as curb-cuts to manage stormwater runoff, Plantronics is saving more than 250,000 gallons of water per year and ensuring that the stormwater that leaves their property is cleaned up before entering our waterways. All turf in the front yard was removed and low water use plants were installed. Rain barrels and a grey water system were also installed. Landscape Designed ByJerry Allison Landscaping, Inc.
Landscape Maintained ByJerry Allison Landscaping, Inc.
At this site the front yard was replaced with low water use plants. There is no irrigation system and hand watering will only be needed once a month during the summer. 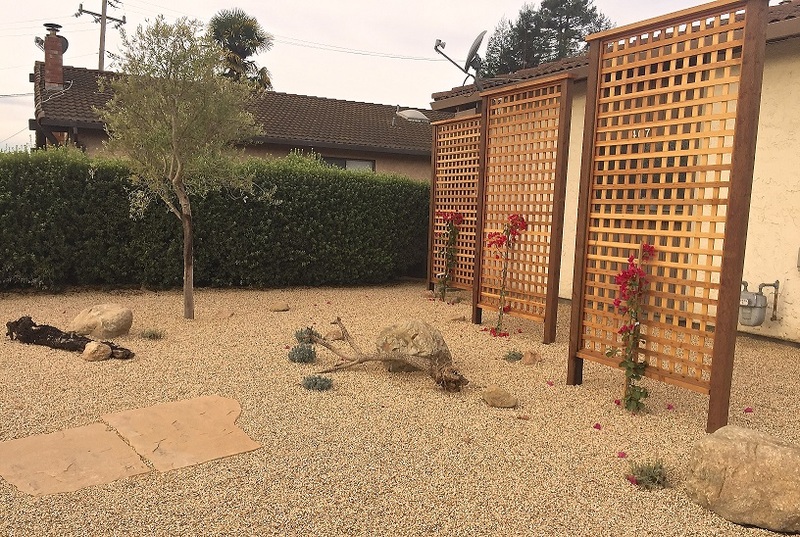 All turf was removed at this site and replaced in the front yard with succulents and a mulch of decorative California Gold pebbles. The back turf area was replaced by an ornamental No Mow grass ground cover. There is no irrigation system and supplemental irrigation of the back yard is only necessary when roof runoff is not adequate. The UCSC Biomedical building was completed in 2012 and LEED Gold certified in 2013. In keeping with the University’s Long-Range Development Plan (LRDP) which prioritizes sustainability, the landscaping surrounding the building was designed to minimize water use and manage stormwater runoff to protect water quality and prevent erosion. 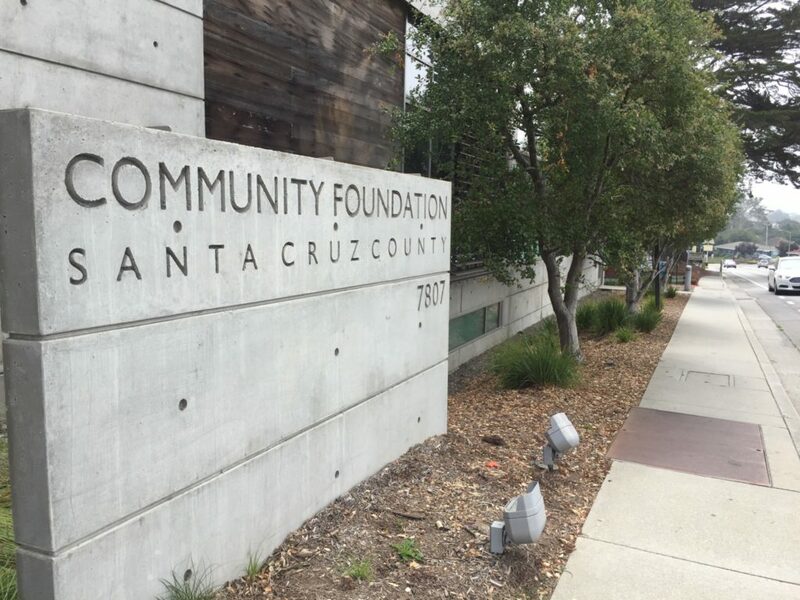 In 2014, Santa Cruz was asked to reduce its water use by 25%. This included UCSC, who met that goal and focused many of their conservation efforts on irrigation. 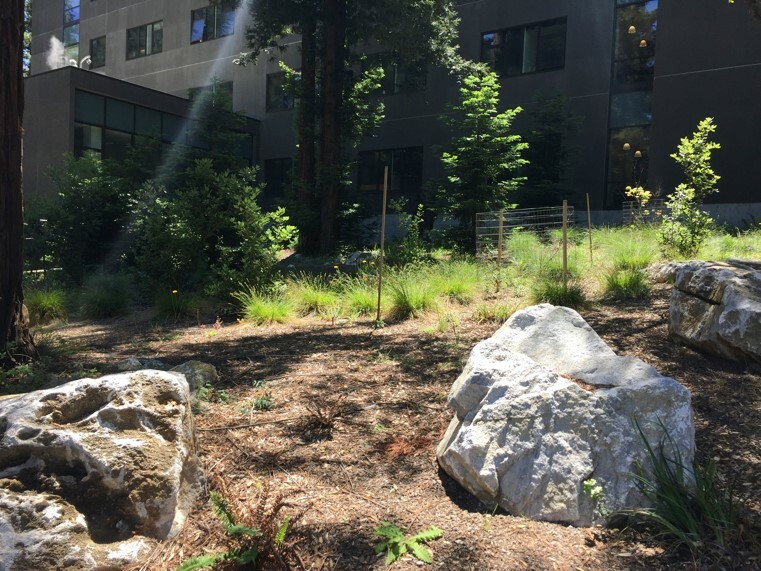 To minimize water needs and to remain compatible with the surrounding native plant community (as laid out in the 2004-2020 LRDP), the landscaping around the Biomedical building features mainly native and drought-resistant plants. All of the run-off from the spray irrigation leads to either a vegetated area downslope of the building or drains that slowly release water into the natural drainage system of the campus. In this UCSC landscape, the trees create plenty of leaf litter for mulch so that no additional mulch needs to be added.The irrigation for this landscape is controlled by an Oasis Control Station which includes features like satellite controllers, evolution flow and weather sensing devices, as well as a personal computer operating system for Windows XP. The system can be remotely controlled from the central computer or accessed from a smart phone. It also provides automatic and timely notifications of system malfunctions. 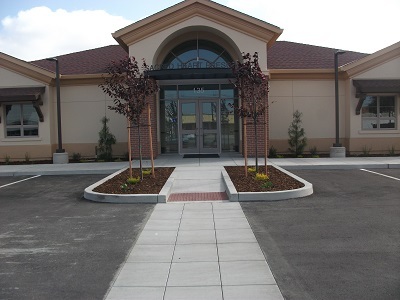 Before the 911 Call Center decided to transform the landscape surrounding the building, large hedges dominated the area, closing in the parking lot and adding little to the building's appearance. 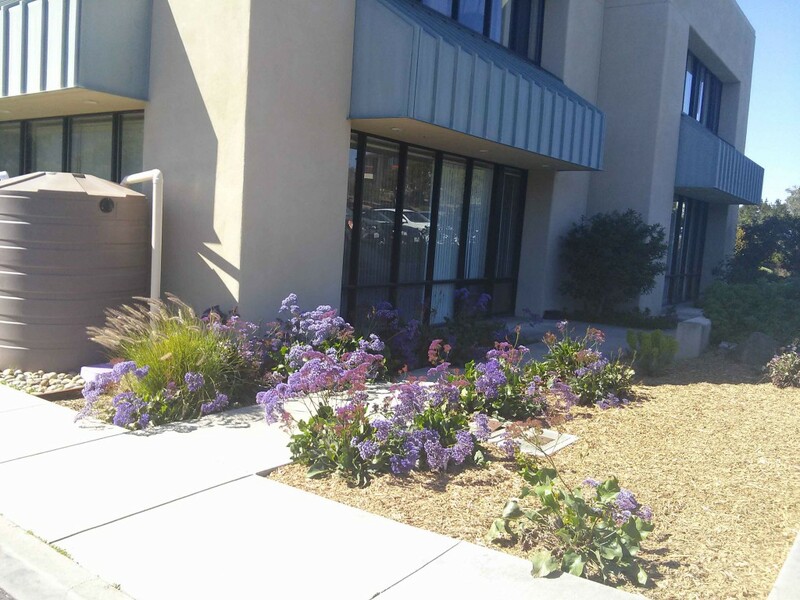 However, the landscape that now surrounds the call center features a rain garden, a variety of beautiful drought-tolerant plants, and a more open and inviting design. When the landscape was transitioning, Cabrillo students participating in a horticulture class used the site to learn how to design landscapes. The class created designs for the front entrance landscape, the area at the back of the building, and the employee entrance area by the parking lot. 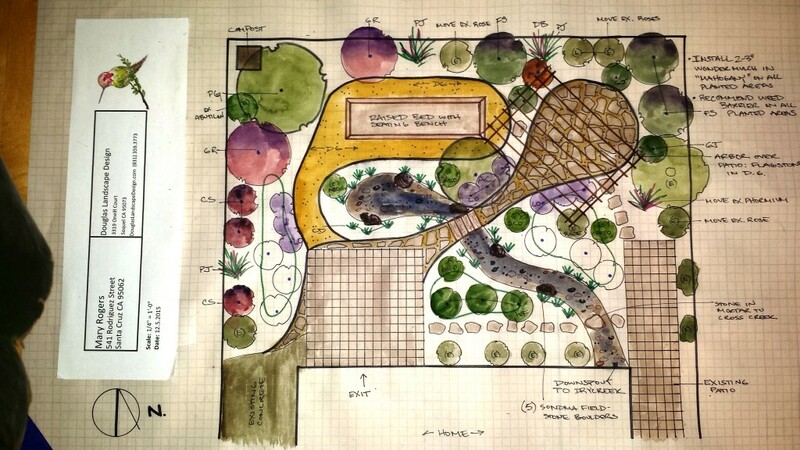 The call center then called in a professional landscape designer, Maggie Duncan, who incorporated parts of the Cabrillo students’ designs into the final designs for these three areas. One feature inspired by the class designs is the dry creek bed rain garden that runs through the landscaping by the front entrance. 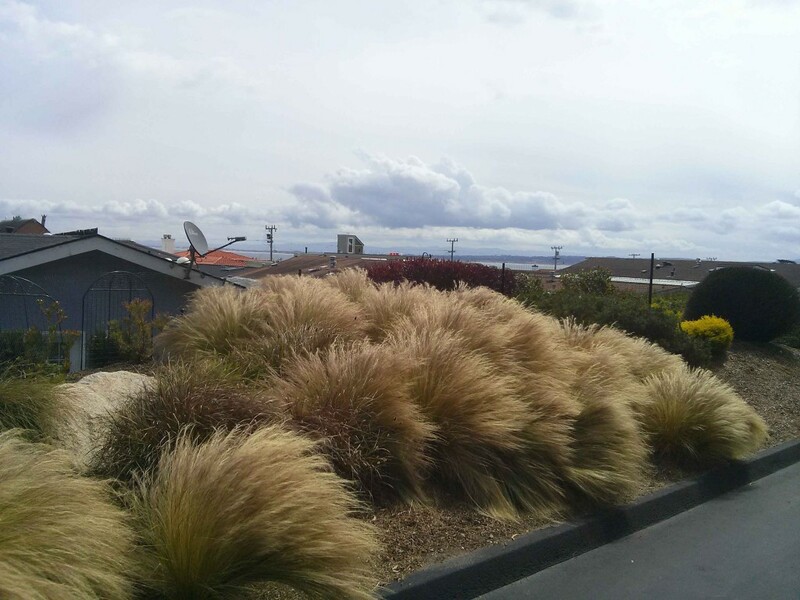 The landscape that now surrounds the call center helps to slow, spread, and sink rain water during storms and provides a beautiful alternative to large, maintenance-intensive hedges. What makes this site interesting is the removal of the driveway and the installation of permeable pavers to capture rainwater on site. The stormwater management element of this property is multi-functional. The swale is also a path to the side gate. This project is evolving. All areas of turf are being converted to low water use plants. Please visit their website for more photos. All rooftop runoff is diverted to bioretention swales. Entire backyard is permeable with all downspouts directed to the landscape. No rainwater leaves the site. Jim and Sandy Giese-Gardner live in the Upper Zayante area of the Santa Cruz Mountains. Their land is approximately 2 acres, however much of the terrain is steep an left to a natural landscape of redwoods, oaks, and madrones. 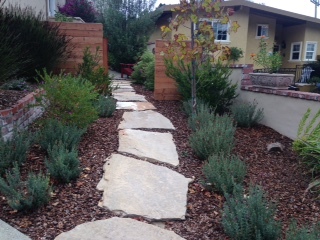 The front yard has been terraced using rock walls that contain beds of drought-tolerant, perennial plantings such as rosemary, lavenders, and sages. 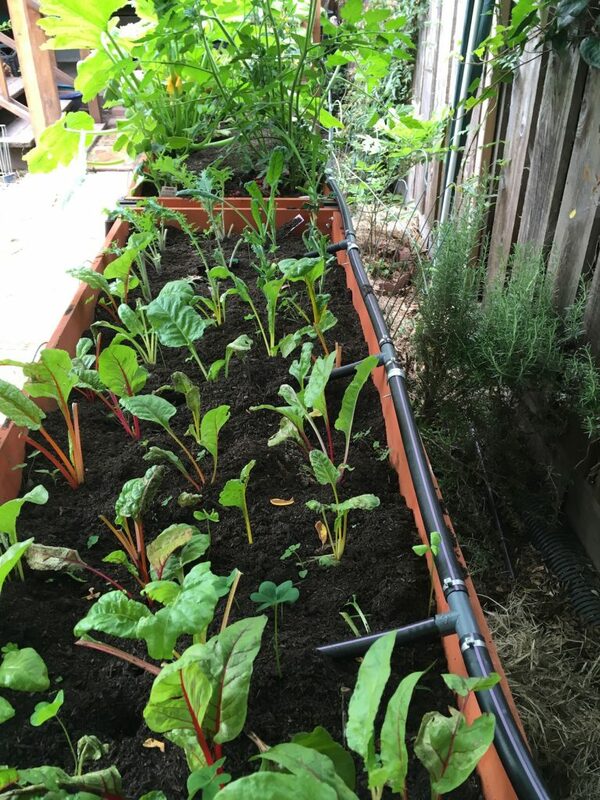 The Giese-Gardners have recently added a 1000 gallon rain catchment system containing two 500 gallon cisterns connected to a pup and filters that irrigates the garden through drip irrigation system. The Owner of this Monterey Bay home transformed her yard into a beautiful and sustainable landscape. 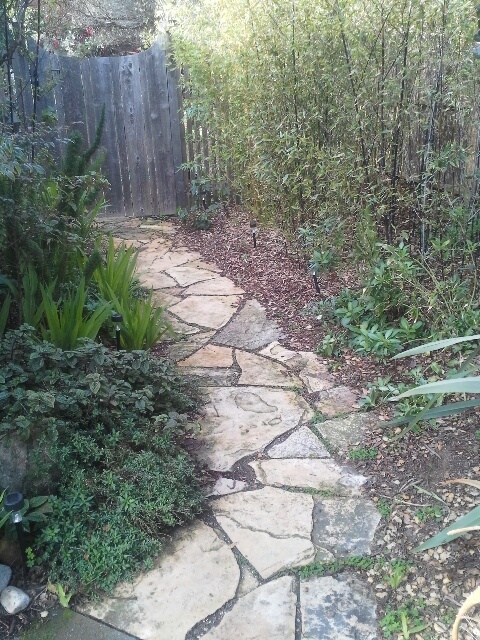 The driveway was removed and converted into a permeable walkway to her backyard. The landscapes are filled with drought tolerant and native plants that are watered once a week for 12 minutes through a drip irrigation system. Over 4” of recycled mulch, was laid over both the front and back yard landscapes and is replaced and maintained by the property owner herself. Instead of using pesticides the homeowner placed gopher baskets around all plants to insure that they would flourish. The landscapes turned into a low maintenance project for the homeowner who is also working on other landscapes as a hobby. Her hope is to show that sustainability can be beautiful. 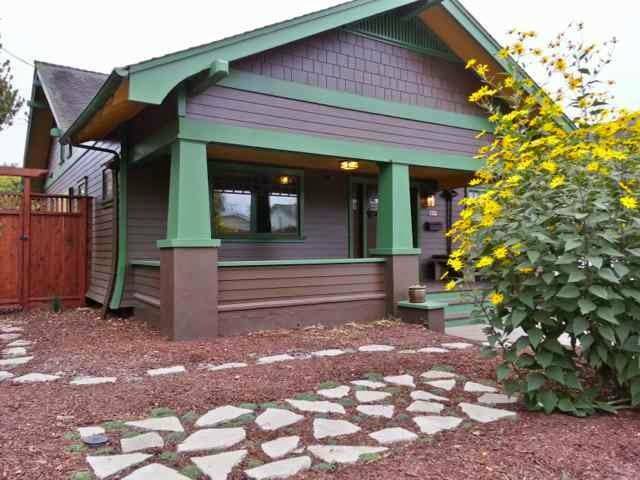 Midori Haus (Midori is Japanese for “green” and Haus is German for “house”), was originally built in 1922, purchased by the owners in 2010, and transformed into a Passive House in 2012. The idea of Passive House is based on the design principle of heating and cooling the house through proper insulation, orientation of the house, and other techniques, without needing the use of heaters or air conditioning. The sustainable design of the house is echoed in the surrounding landscape. When the house was purchased it had a lawn in both the front and back yards. However, after the house began its green transformation, the lawns were sheet-mulched to remove the need to water those areas. Besides eliminating the need to water the lawn, the owners have also seen the benefits of sheet mulching in the form or happier plants (fed by the moisture trapped in the ground by the mulch) and eliminated flooding of their back yard. A greywater system is also in place to direct used water from the washing machine into the landscape. 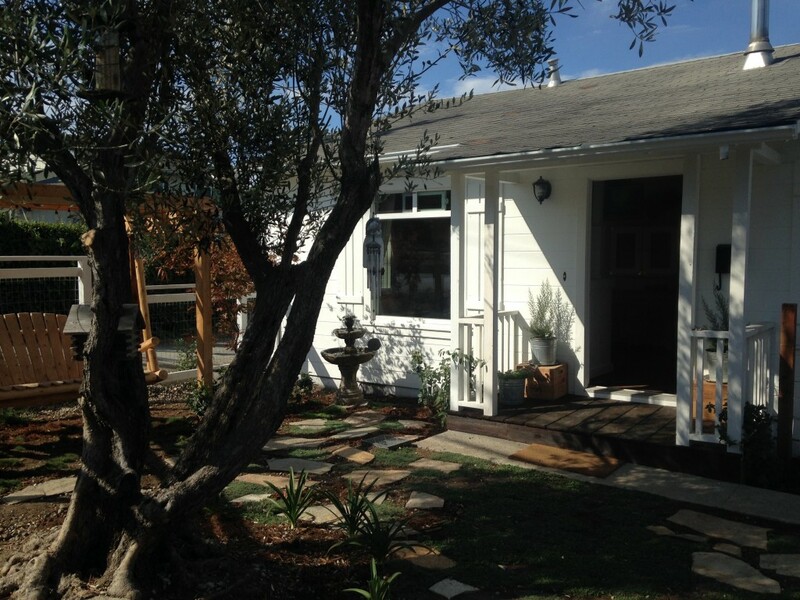 Along with drought-tolerant plants and a rain cistern that serves nonpotable functions inside the house, Midori Haus is a great example of a Monterey Bay Friendly Landscape! Thirty years ago, the front yard consisted of weedy grass and 2 nondescript trees. It has been through many phases, slowly evolving towards more drought-tolerant plants, but still needing regular summer water. 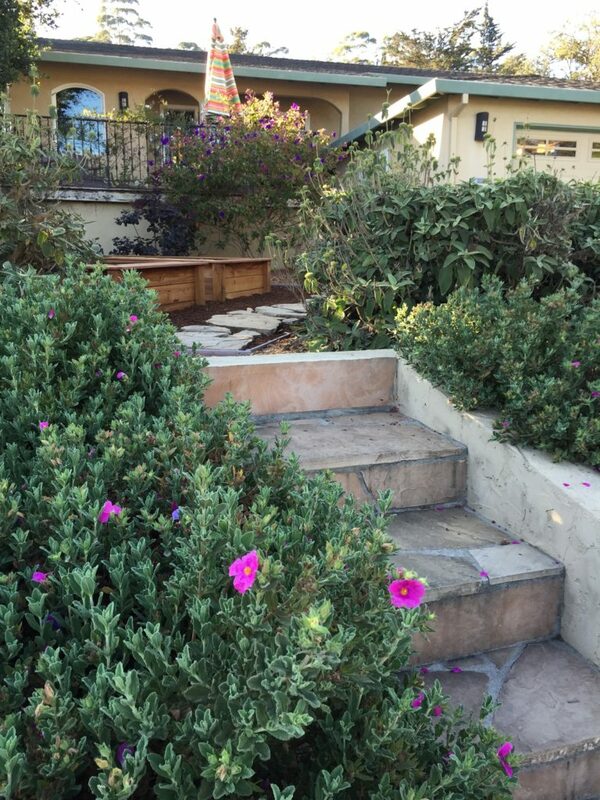 Nancy and Andre finally took the leap and removed the hedge, thirsty shrubs and flowers. They built a fence and contoured the landscape to facilitate the drainage preferred by the natives they planted. They also created a bioswale to accommodate runoff from the rain barrels. Finally, they sprinkled central coast wildflower seeds all around, and are looking forward to next spring! They anticipate minimal watering next summer, and almost none once the plants are fully established. Their goal was to create a bird, butterfly and bee garden, and to minimize maintenance and water consumption. 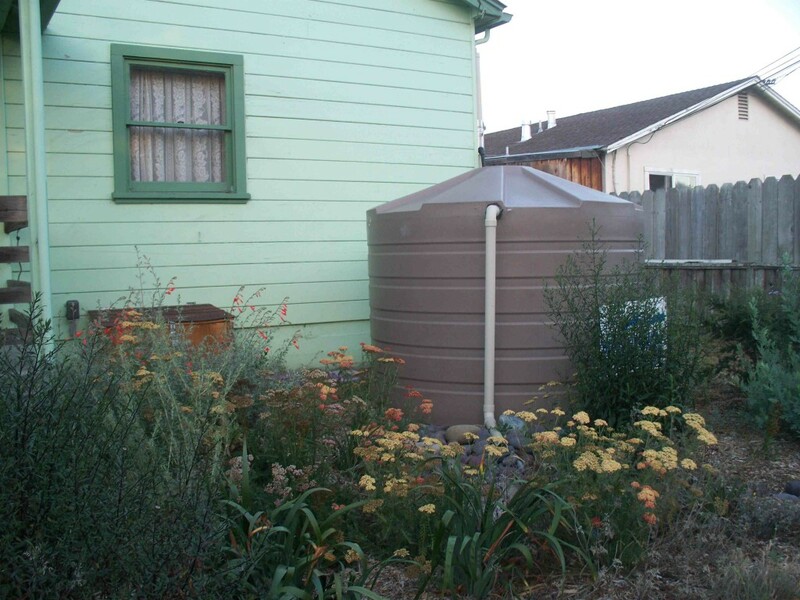 Several years ago, they began acquiring rain barrels through the City program, and now have 480 gallon capacity. They also installed a laundry to landscape system for 3 fruit trees in the back yard, along with lots of native plants, so are able to use the rainwater mainly for the vegetable garden and porch containers. This new construction has a large Monterey Bay Friendly stormwater infiltration system built in. All downspouts from 2000 square feet of roof drain to two large percolation pits (4'x4'x4' each). Any runoff that doesn't infiltrate in the percolation pits is directed to the drycreek which runs through the front planted area. Additionally, a beautiful rain chain drains to the same system. The front yard of this property used to be a dog kennel's recreation area with a dirty artificial lawn that was falling apart. Upon purchase of the property, the homeowner's goal was to transform the space into their own personal homestead; somewhere they could relax after a day of hard work with the look and feel of the Live Oak farmhouse that existed on site when the home was constructed in 1947. If they were going to use water for landscaping they preferred to grow edible plants, flowers and shade trees. The artificial lawn was replaced with permeable paving stones and an edible garden with raised beds and fruit trees. This very sweet cottage has been beautifully updated inside and out. The driveway was replaced with crushed granite gravel, new drought tolerant landscaping replaced dried out compacted soil beds, 4" of recycled mulch was laid down and all downspouts recharge groundwater by infiltrating into pits or through perforated pipe the length of a native planting bed. Roof water for a 1" rain event will produce approximately 400 gallons of water right back into the landscape. A lovely Lyonothamnus stand create a feathery tall screen between neighbors giving a very woodsy feel for the recently relocated Pacific Northwest owner. The Salvador sisters wanted a landscape for their rental property that would be easy to maintain. They removed turf and installed drought tolerant plants from Sierra Azul Nursery in Watsonville. 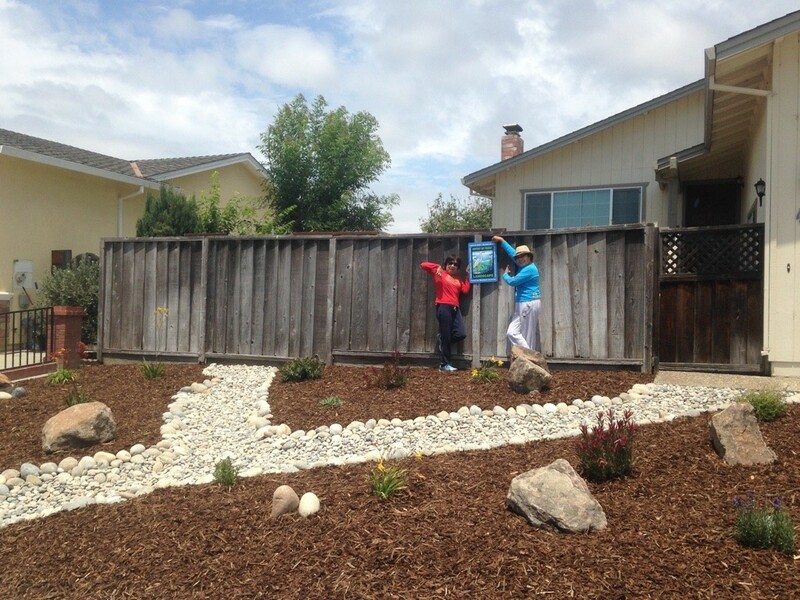 They also took advantage of Monterey Bay Friendly rebates to incorporate a dry creek bed and rainwater harvesting in their landscape project. Landscape Designed ByBlue Door Garden Design, Inc. This lovely early California farm house cottage, was flanked in boxwood hedges and cool season turf. 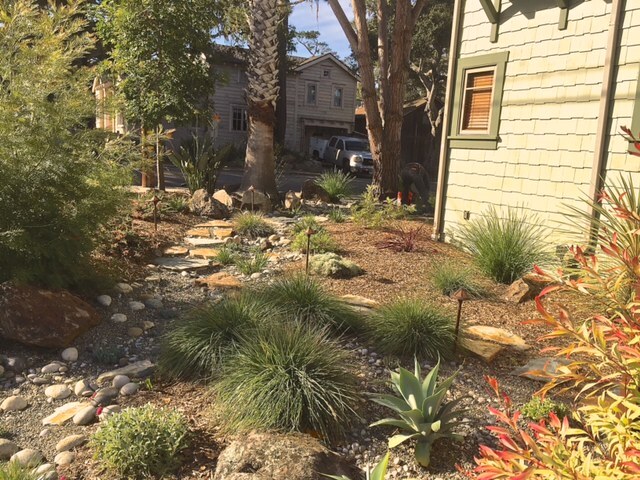 It was very green and boring until a Monterey Bay Friendly Landscape retrofit turned it into a low-maintenance, beautiful garden! This Monterey Bay Friendly Landscape is set on a coastal bluff across the street from Moore Creek Preserve. The homeowners wanted to restore some of the native coastal sage scrub habitat. They also wanted their new landscape to provide food and shelter for pollinators and harvest rainwater from the roof. Excavated soil from the rain garden was used on planting mounds over turf. 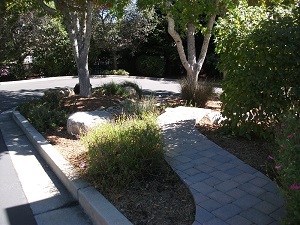 ECI also installed retaining boulders, and permeable (decomposed granite) path, sitting area, and rain garden overlook. The goal of this landscape makeover was to remove non-functional turf and create an entertainment area. 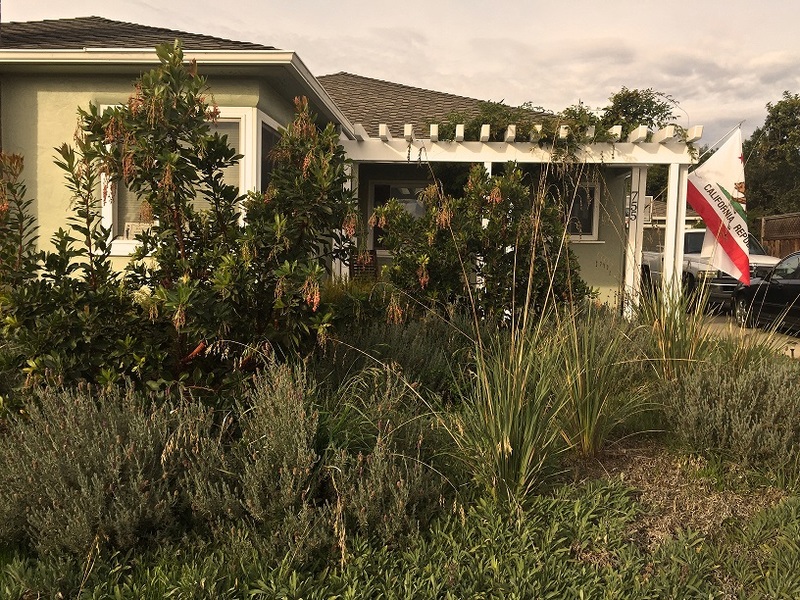 The property owner took advantage of Scotts Valley Water District's Monterey Bay Friendly Landscaping rebates to replace turf with low water use plants and redirect roof downspouts to landscaped areas. Rainwater from 1,000 square feet of roof that was piped directly to the street is now infiltrating into the sandy hillside soil through gravel lined percolation pits, irrigating plants on its' way to recharging Scotts Valley's groundwater aquifer. When the Clarks bought their 1914-era home some years ago, the house was surrounded by extensive water-hungry lawns and other thirsty plants. A driveway of an impermeable material completely encircled the house, taking up much of the potential garden space and spilling rainwater onto the hillside below. After the shock of receiving a one-month bill from the water company of more $600 when the existing drip system malfunctioned, they were determined to transition from all the water-greedy plants to those that needed little to no supplementary water. Jennifer Clark Colfer, a landscape architect with Arnone & Associates helped them set goals in transforming the space. The homeowners did much of the labor themselves. The lawn was removed and natives and plants from Mediterranean regions were installed in the front garden, creating a space that needed no supplemental water at all. 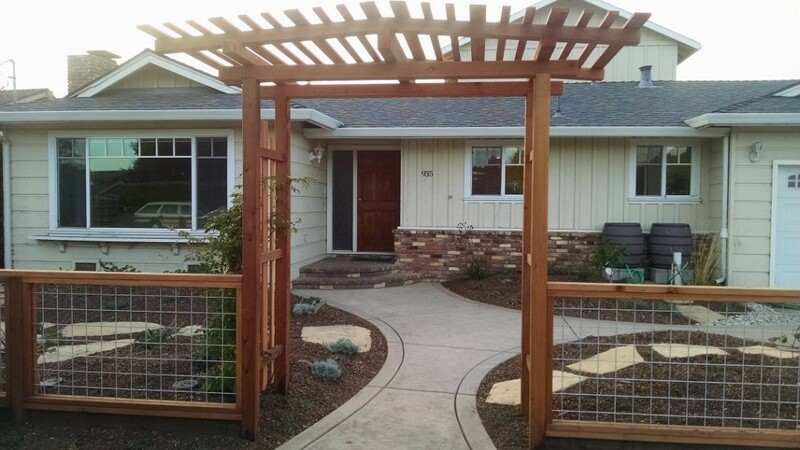 The driveway was removed and replaced with permeable gravel paths and stonework, the soil was improved with compost, while a line of Leyland cypress and other drought-tolerant screening plants provided privacy from the neighbors. 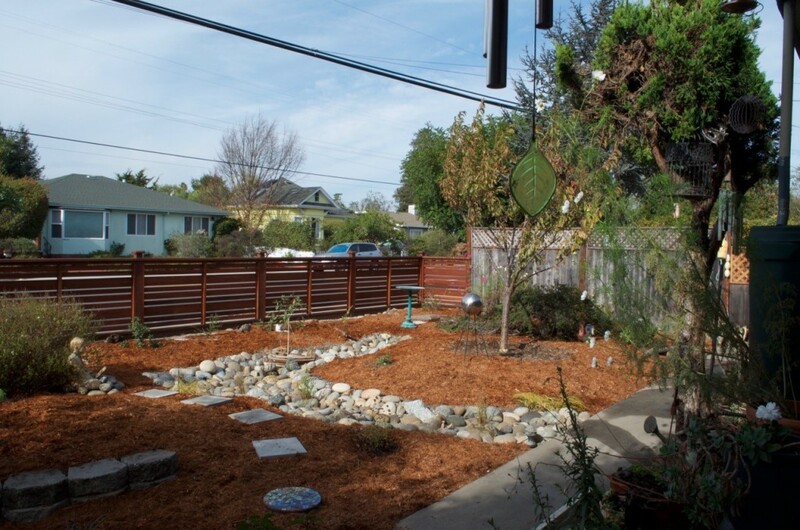 A laundry-to-landscape greywater system was installed to convey washing-machine water to the back garden to irrigate fruit trees and other ornamental plants. Under a deck, in consultation with Love’s Gardens, a water-catchment system of linked recycled food-grade barrels was installed that harvests rainwater from the roof, and stores water for irrigating plants in the back garden. A more attractive barrel was placed on the deck to store water for use on the container plants. Monarch Pines HOA is a mobile home park located next to Lovers Point. 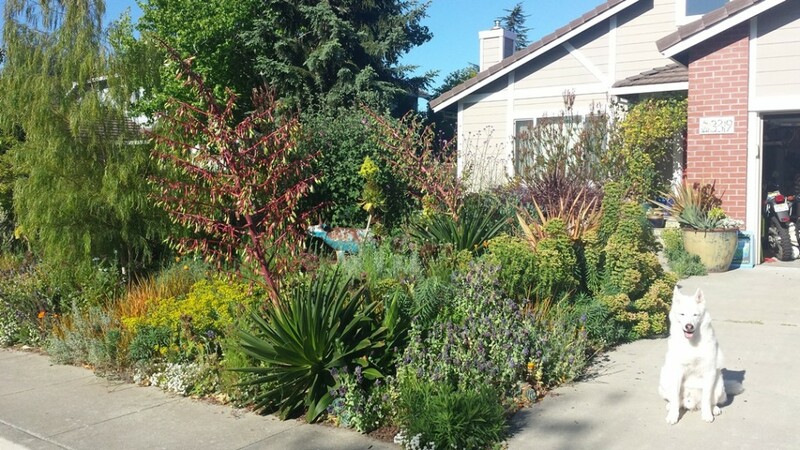 They began their landscape transformation in 2003 when they removed 95% of their lawn area and replaced it with native plants and drip irrigation. 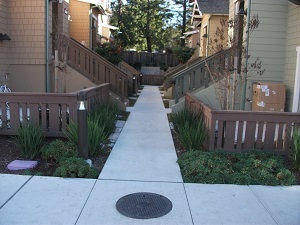 Over the last few years they have continued to upgrade the property to make it more Monterey Bay Friendly. Most recently they removed the turf next to the Club House and installed a artificial lawn including a bocce ball court and a putting green. Better Gardens made corrections to their drip irrigation system that has saved them $800 per month!!! Great work! The Seacliff Garden Apartments replaced the original 35+ year-old overgrown landscaping and 6,000 square feet of non-functional turf with beautiful and colorful California native and Mediterranean plants and a 250' dry creek that runs the length of the property. This landscape uses only recycled water. Most roof runoff is directed to a catchment area below the parking area where it slowly percolates into the soil. This large commercial site maximizes rainwater infiltration and truly demonstrates the whole suite of ecological landscaping principles. A 33,000 square foot parking lot and all downspouts from a 38,500 square feet of impervious roof are directed into a 1000 square foot drycreek which runs the length of the building and ends in a 1,800 square foot planted bioswale. The plant palette is spectacular and consists of mature, low-water and low-maintenance Mediterranean and California native plant selections. Construction of a new wing of this medical facility triggered a total landscape redo. New design featured removal of 3,100 square feet of non-functional turf and replacement with beautiful, low-water plants. Additionally, all downspouts are directed into a 160 square foot bioswale featured in the front of the building. 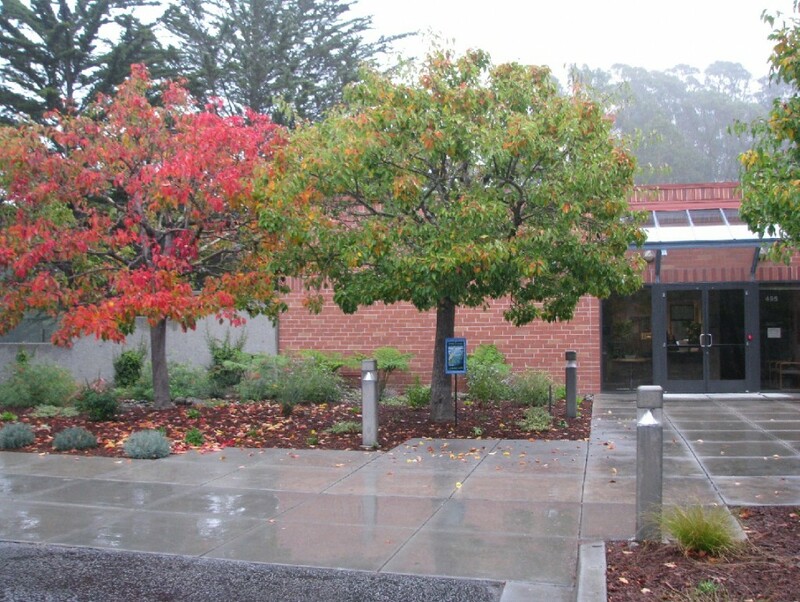 The original landscape in front of the Monterey Peninsula Water Management District office was drought tolerant, but had many large shrubs that had to be sheared because were planted to close to sidewalks and walkways. These shrubs were replaced with more appropriate plants that naturally fit into the narrow sidewalk planters to reduce green waste and landscape maintenance. 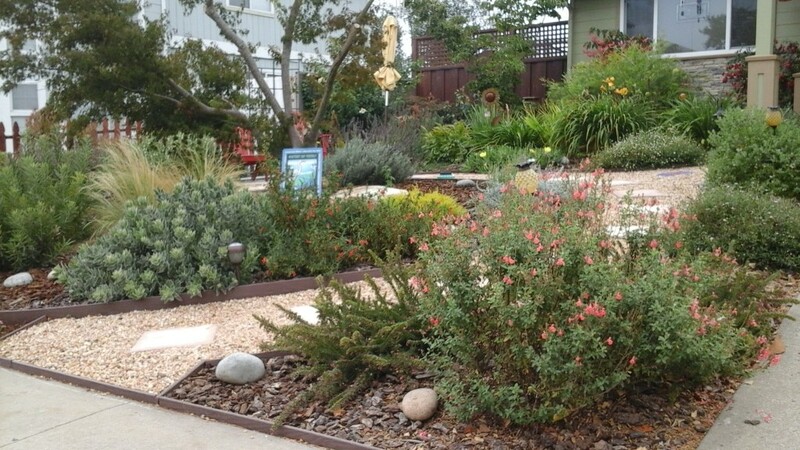 Our new Monterey Bay Friendly Landscape showcases the landscape practices for which the District provides rebate incentives for, such as rainwater harvesting, turf replacement with climate-appropriate plants, and weather-based irrigation controllers. 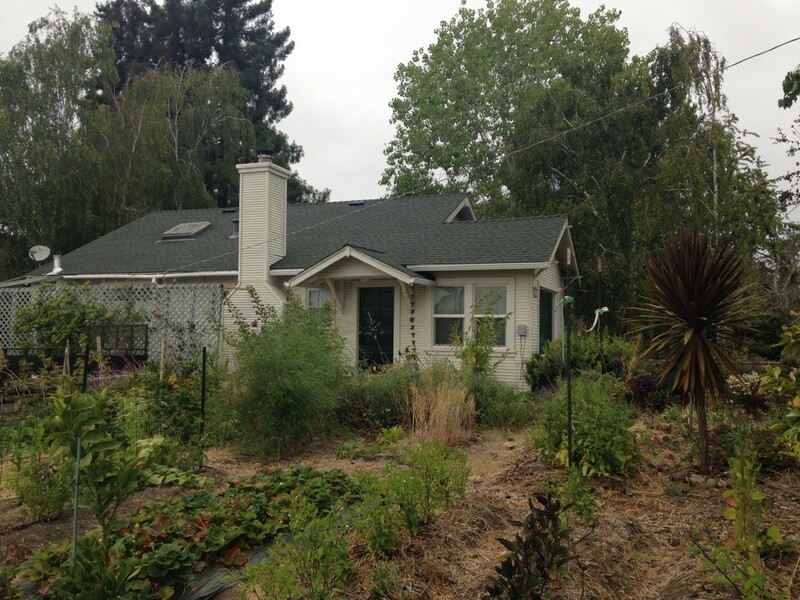 The Santa Cruz Live Oak Grange is a community center and hub for advocacy and activism on behalf of family farms, organic agriculture, and local resilience. Most of the Grange garden is dedicated to a community garden and demonstration orchard with over 20 heirloom fruit trees. 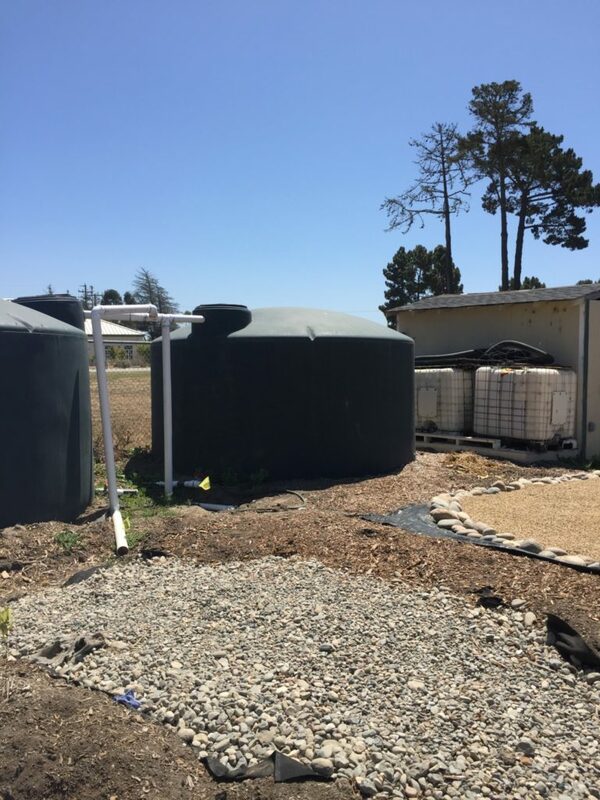 In 2014, the Grange installed the first rainwater collection system for toilet flushing on a commercial building in Santa Cruz County. 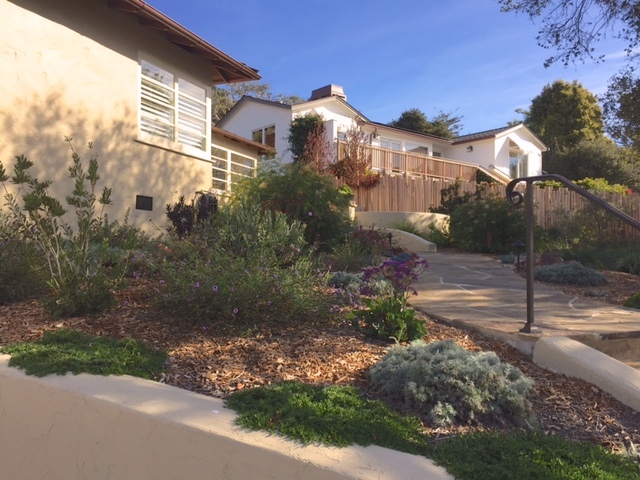 The installation of the 1320 gallon cistern gave the Grange the opportunity to re-landscape the front of the property with fast growing California native shrubs like Flannel Bush and Ceanothus that shade the cistern, and a rain garden to infiltrate overflow from the cistern into the landscape. The Grange also has a smaller rainwater harvesting collection system made from recycled barrels that provides water for chickens. The former Sentinel newspaper office in downtown Santa Cruz was remodeled and re-landscaped by co-owners Ecology Action and Cruzio. The renovation earned a LEED Gold certification, that is the second highest certification in the program established by the U.S. Green Building Council. Among the green features are expansive glass doors and windows and 42 skylights providing natural light, energy efficient lighting, a rooftop solar system that provides hot water and about half the electricity, restrooms with waterless urinals, dual-flush toilers and low-flow faucets, a charging station for seven electric vehicles, on-site composing and a rainwater harvesting system to irrigate landscaping. The established California Native and Drought tolerant Landscape uses 90% less water than conventional landscaping, and survived the 2014 drought year with no irrigation at all. 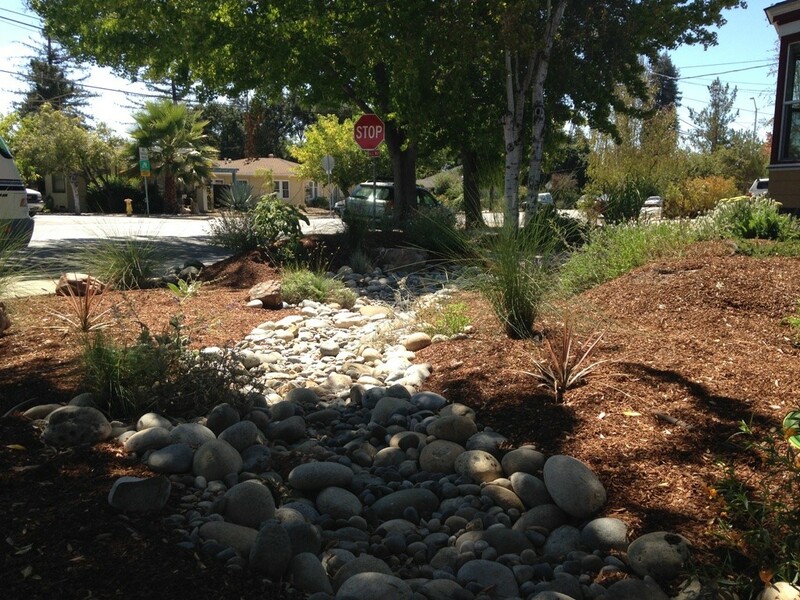 Landscape Designed ByMichael Arnone and Associates and installed by Prime Landscape Services Inc.
Soquel Creek Water District strives to practice what we preach, to encourage our community to conserve water in the landscape. Over the past years we have used our own landscaped area around our District headquarters as a showcase and training ground for low-water use landscaping when possible. Through a partnership with the Resource Conservation District of Santa Cruz County, a California State Water Resource Control Board grant was awarded to help fund the re-landscaping of the headquarters building to demonstrate Low Impact Development techniques especially with regards to reducing run-off from landscapes and conserving water. The site features a 2,825 gallon rain harvesting tank, a rain garden, and an infiltration basin that diverts the rain gutter drain into a permeable rock layer with underground crates to allow the water to seep into the ground instead of running off into the storm drains. parking lots. 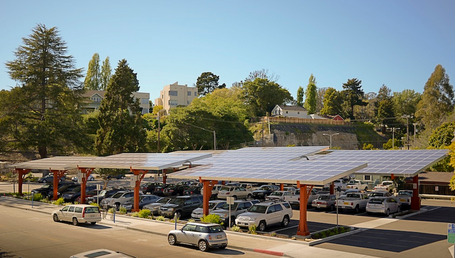 The 386kW solar parking canopy was financed using a modified Power Purchase Agreement that required no upfront costs to the City and provides a savings to the General Fund (lower than if power were purchased from the utility). The Solar One project provides shading for staff vehicles and reduces the heat island effect of the existing parking lot. 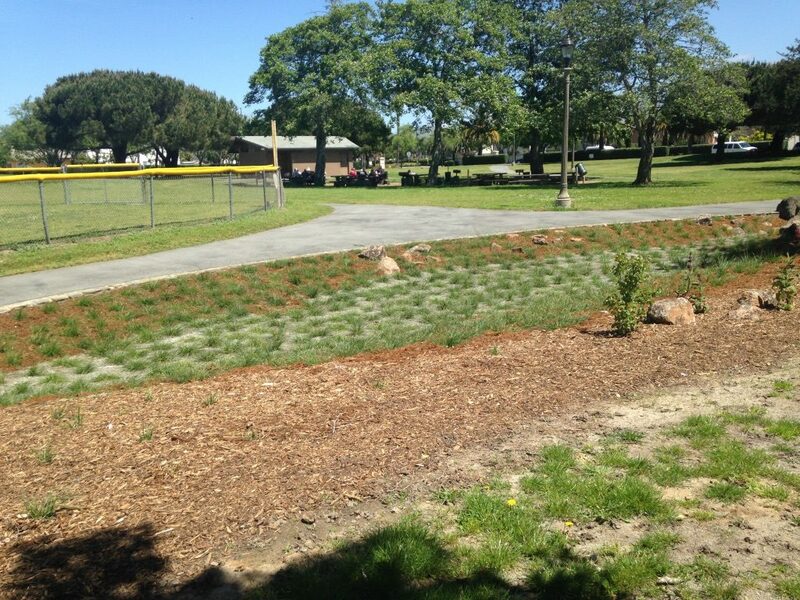 During construction, bioswales were added to the parking lot area to filter and detain stormwater run-off from the parking lot before it enters the stormdrain system and flows to the San Lorenzo River. This beautiful landscape was originally designed by Michael Arnone & Associates, and installed circa 2008. It features LID (Low-Impact Development) design techniques such as dry creek beds that retain rain water from the roof, bioswales to filter water from the parking lot, and a diverse selection of drought- tolerant plants. Due to budget cutbacks over the years, landscape maintenance was dropped and this landscape was left in nature's hands, without irrigation, therefore only the hardiest plants survived. The landscape came to the attention of the Central Coast Chapter of the CLCA who adopted it as their community service project for 2015. 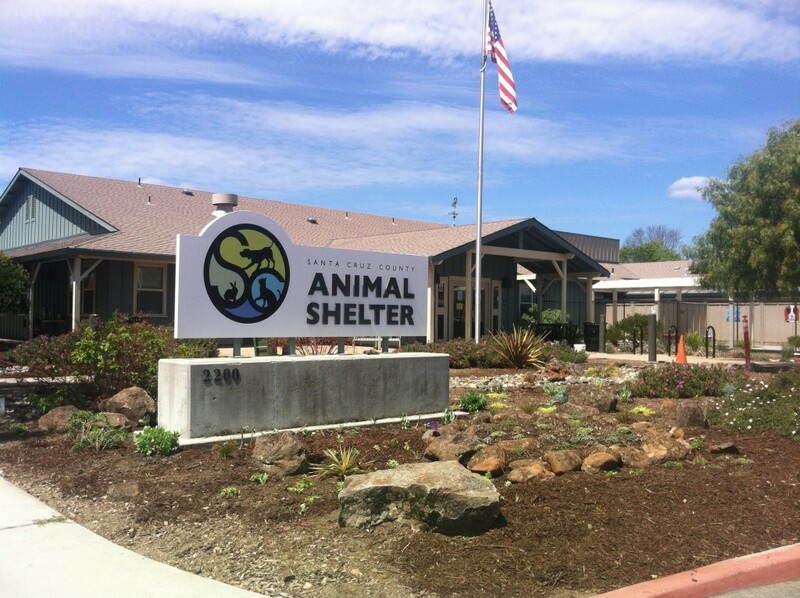 Shelter staff and volunteers requested a renovation to mulch, replace dead plants, create an attractive entry and add trees to the parking lot to provide shade and reduce heat for patrons and their animals. 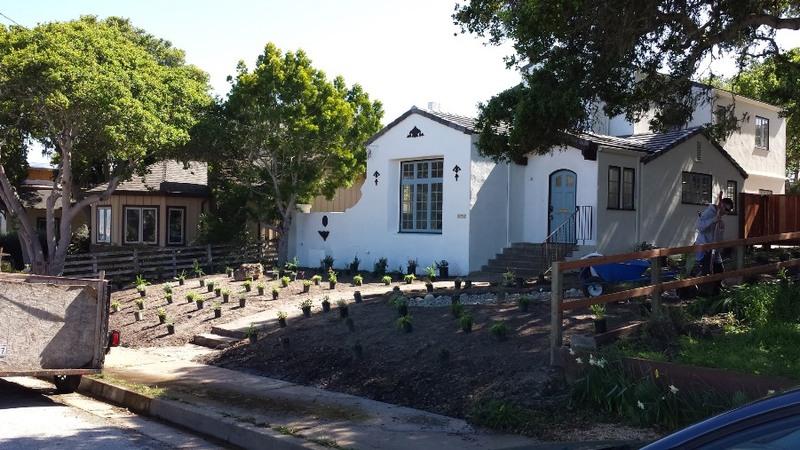 Through generous donations of time, labor and materials by local businesses this Monterey Bay Friendly Landscape is once again an attractive part of the neighborhood. 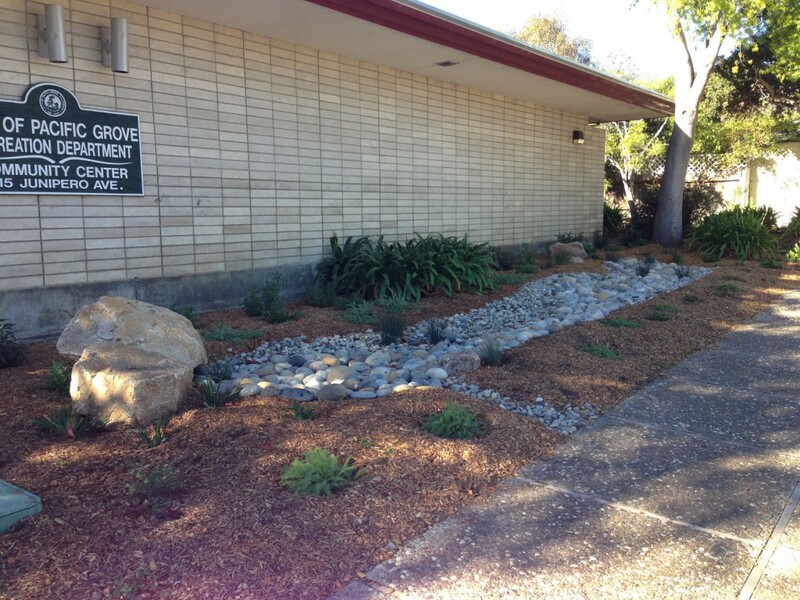 The Pacific Grove Community Center is located within a watershed where stormwater flows to an Area of Biological Significance (ASBS). The Pacific Grove ASBS skirts approximately three miles of Monterey County’s coast near the City of Pacific Grove and Monterey Bay. With close to 500 ocean acres, this ASBS features a rich variety of marine life from the sea floor to the surface. Stony sea corals, giant green anemones and orange puffball sponges pepper the sea floor, as black perch and striped sea perch swim above. The State Water Board has determined that the Pacific Grove ASBS is contaminated with many pollutants found in stormwater run-off from city surfaces such as rooftops, streetscapes, parking lots, sidewalks, and medians. 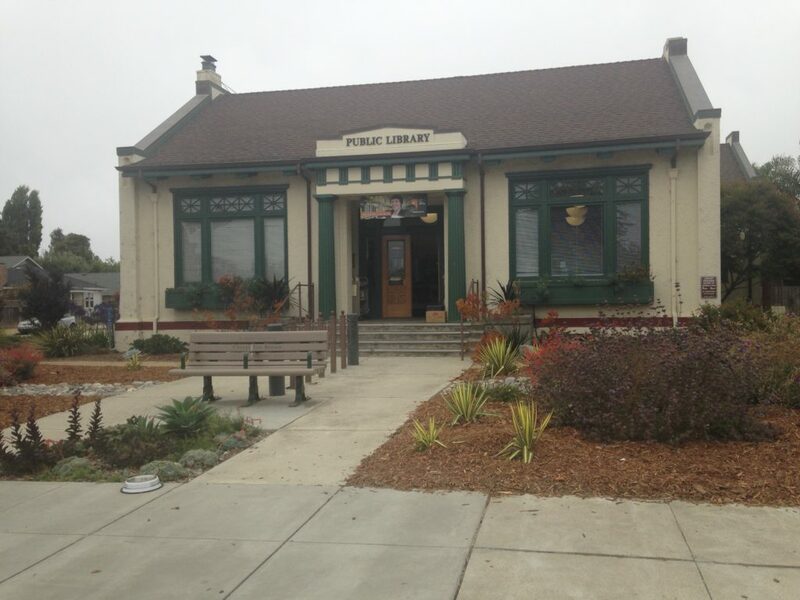 The Pacific Grove Community Center is a resource and gathering place for many residents. It provides the perfect opportunity to showcase examples of Low Impact Development (LID) techniques that filter polluted stormwater from city surfaces. A selected downspout has been diverted/re-routed to the front entry landscape in a rain garden. When it rains, the water enters the landscape and slows the water down, filtering it by movement through the soils and plant roots. Not only does this help clean the rainwater, but adds an aesthetic landscape feature to the property. Mainly native plants are used and all plants are drought-tolerant. 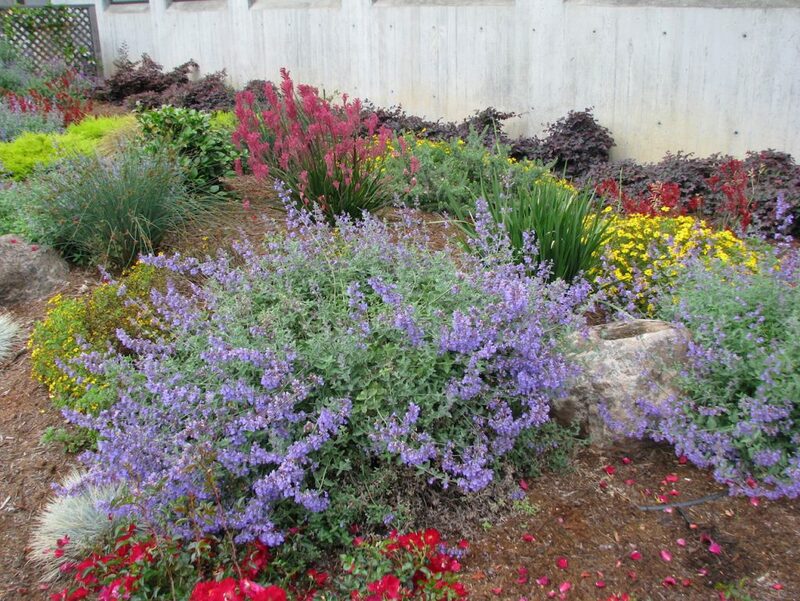 The Scotts Valley Water District has an excellent demonstration garden that features California native plants from plant communities found in the Santa Cruz mountains. To meet Monterey Bay Friendly Landscaping standards, shrubs and trees in parking medians had to be pruned to restore them to their natural form. 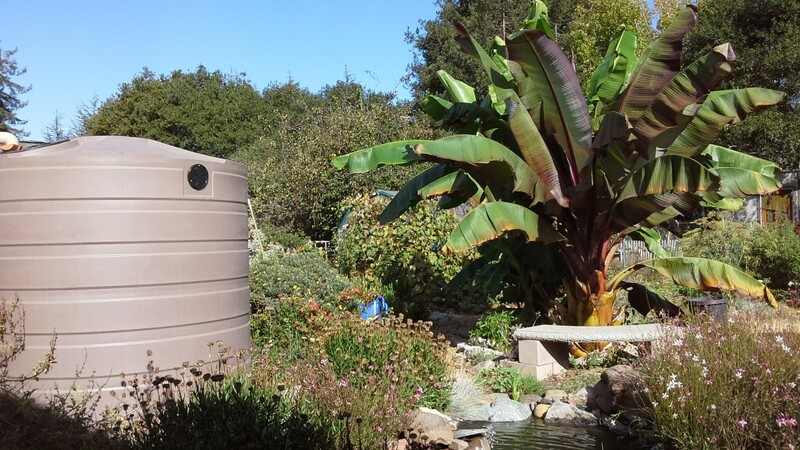 There is a rain barrel on site and all landscape is irrigated with recycled water from the City of Scotts Valley. MEarth is an environmental education nonprofit with roots in Carmel Valley, California, that is growing the next generation of environmental leaders through education, collaboration, partnerships and community action. 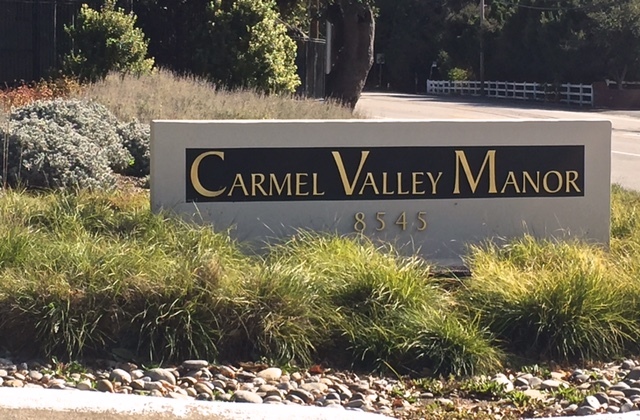 MEarth began by providing instruction to students in the Carmel Unified School District (CUSD) at the Hilton Bialek Habitat. We continue to serve CUSD students throughout the year through our six-week “Ecoliteracy” curriculum for all sixth-grade students of Carmel Middle School, and customized culinary and science-based programming for the school’s World Language, Science, History, and English-Language Arts classes. Each year, approximately 1,500 CUSD students come to The Habitat for sustainability education, and 5,000 members of the public visit annually. 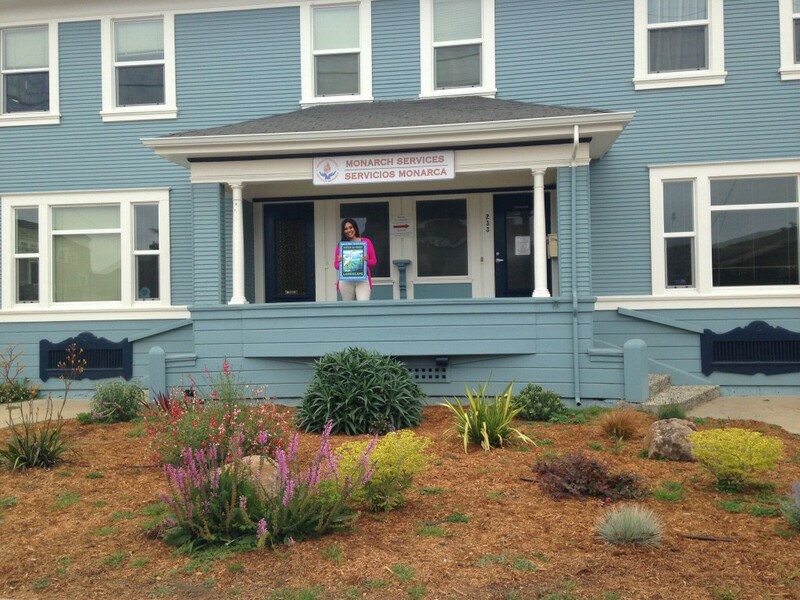 The UC cooperative extension building in Watsonville is an older building that had overgrown and high water use shrubs, an outdated irrigation system, and irrigation runoff to sidewalks and pavement areas. 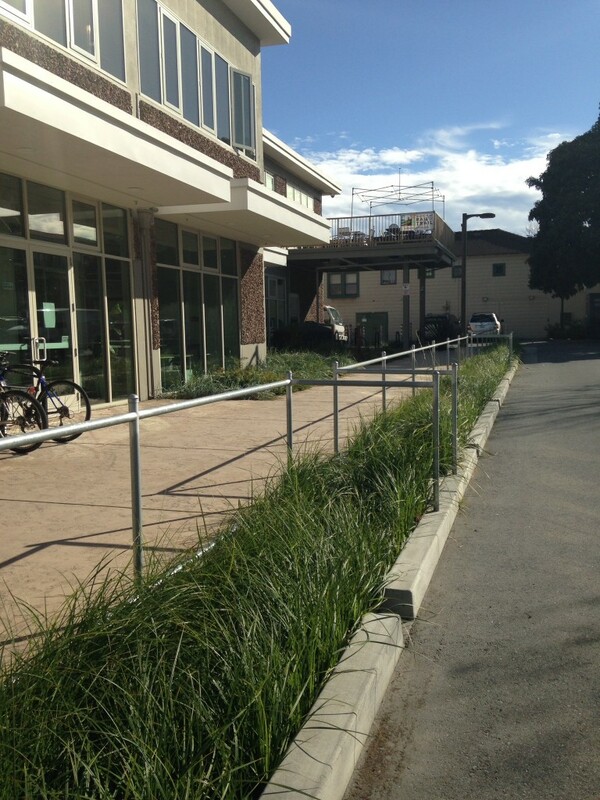 The Monterey Bay Friendly Landscaping certification process began with removal of large inappropriate shrubs that were overhanging walkways. New, appropriately sized, drought resistant plants were then planted in the landscaped areas and borders were created to retain mulch. 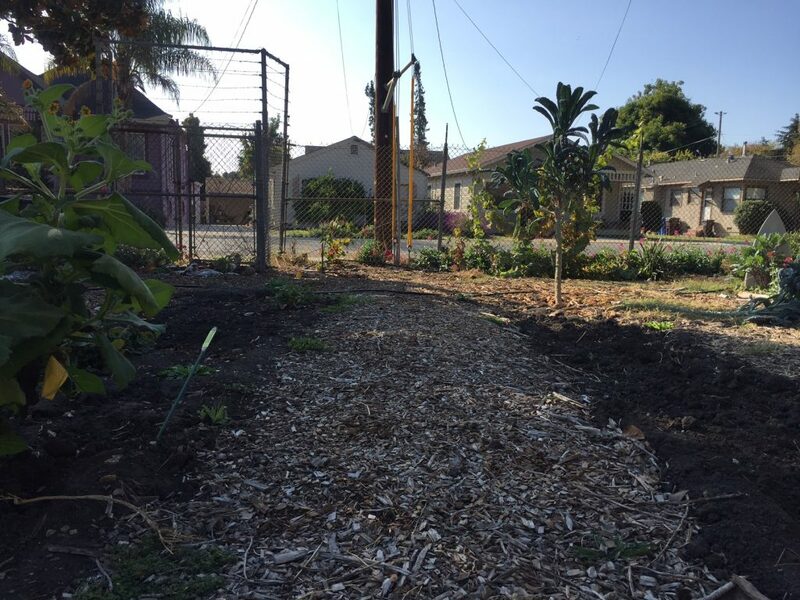 once plants were in, a drip irrigation system was installed and the area was covered with 2-4 inches of locally sourced mulch from a local tree trimmer. The existing irrigation controller was replaced with a Rain Bird ESP smart controller with exterior rain and temperature sensors. Programming of the controller was specific to location, soil conditions, plant type, and irrigation setup. Lastly, a rain catchment feature was created that captures rain runoff from the 600 square feet of roof and diverts it through a dry creek bed and basin so the runoff remains on site rather than flowing to the stormwater system and Corralitos Creek. The basin was planted with water tolerant sedges to slow the water flow and prevent erosion. The Monterey Bay Sanctuary Exploration Center is located in Santa Cruz across from the Municipal Wharf. All stormwater runoff from the building is directed into the landscape via rock-lined swales. 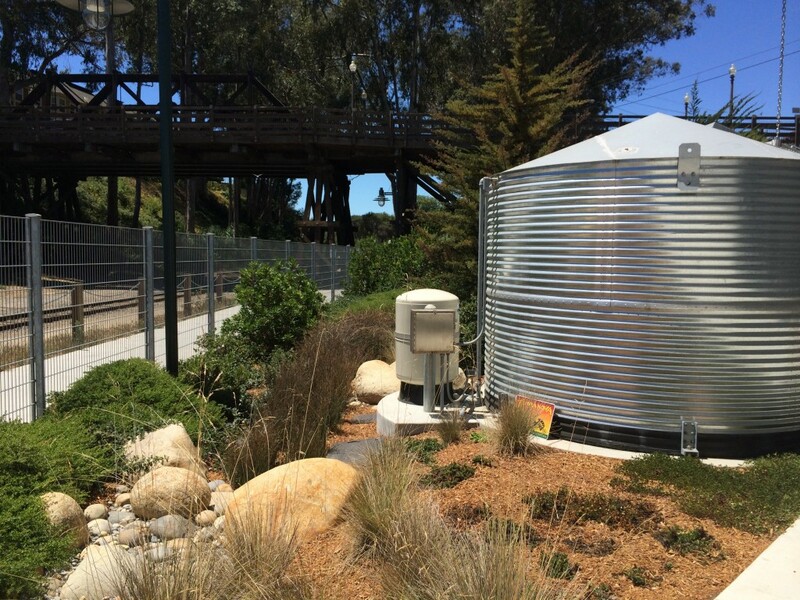 A 4,800 gallon cistern captures rainwater to irrigate California native landscaping. When rainwater is depleted during the summer months, aquarium water (from freshwater tanks) is siphoned into the cistern to supplement irrigation. 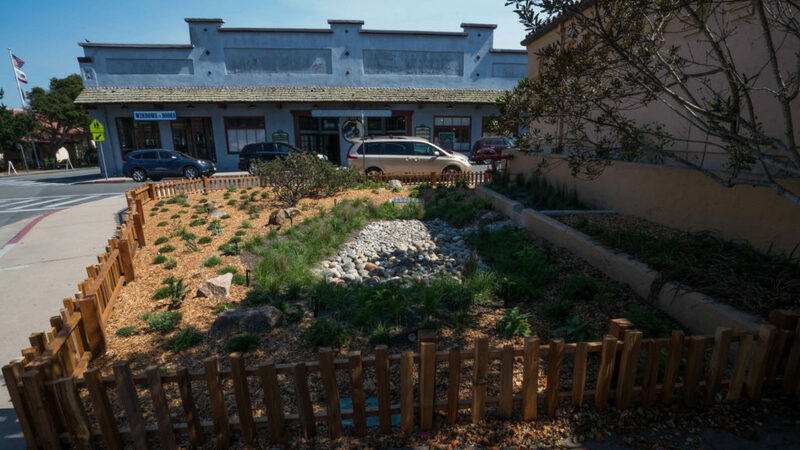 The Marina Coast Water District’s Water-wise Landscape Demonstration Garden was created from an old abandoned lot into a vibrant public space that motivates community members to practice and learn more about water-wise garden design principles and practices. 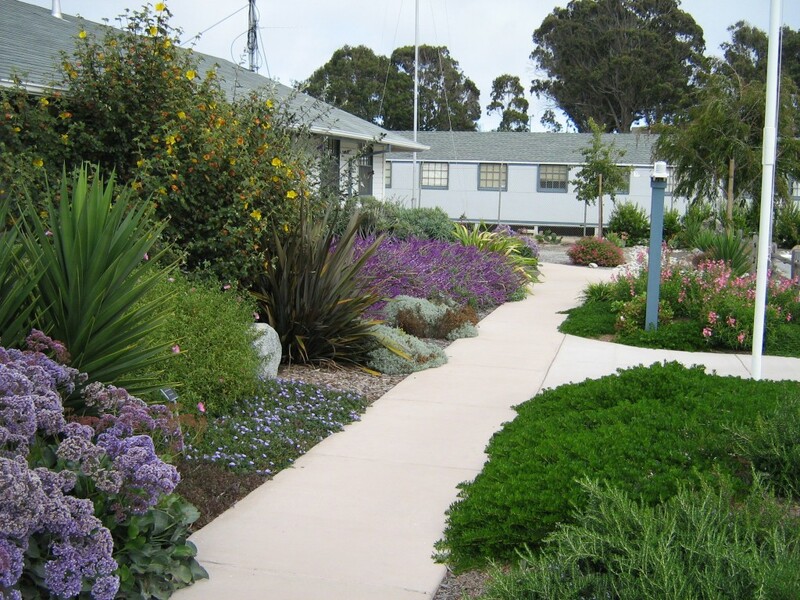 The Landscape Demonstration Garden is located in front of the Marina Coast Water District offices at 2840 4th Ave in Marina. The site is just south of Imjin Parkway in the former Fort Ord. Guests are asked to visit the garden during business hours, 8am -5pm on Monday -Thursday. This courtyard area is a place for students, families and staff to gather. It is also a place to demonstrate Monterey Bay friendly landscaping principles to the next generation of land and water stewards. 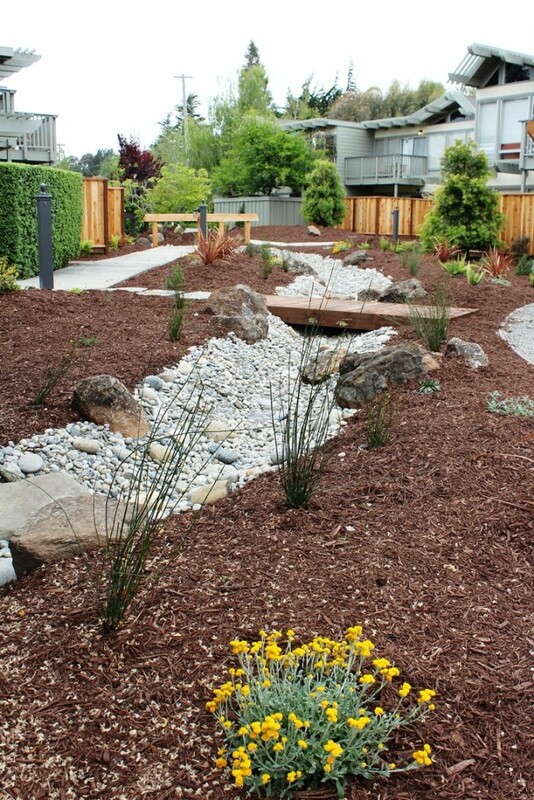 A large bioswale that runs along the perimeter of the courtyard exemplifies the "slow it, sink it, spread it" approach to controlling storm water run off on site. Permeable pavers in the courtyard also allow water return to the soil. Rainwater cisterns gather supplemental water for edible plantings such as persimmon and apple trees. Tile mosaics created by students on the face of raised planters depict the salmon life cycle in the local watershed, creating a connection to the larger environment that surrounds us. Drip irrigation, and a native and water wise plant palette reduce overall water consumption. Chartwell is the first LEED platinum school built in the United States. Chartwell receives visitors interested in both green design and education from all over the world. We welcome guests, and ask that anyone interested in touring Chartwell please call 831.394.3468 to set up a tour date and time. Visitors, staff and students at Chartwell enjoy day-lit classrooms with carefully planned window systems that reduce the need for electricity by 50% (Studies show day-lighting alone can contribute to increases in the rate at which students learn reading and math of 20% or more. ), a roof that reduces heat and catches rainwater for toilet flushing, microfans and air quality sensors in classrooms that take advantage of naturally occurring convection currents (this eliminates the ambient noise of other ventilation ducting systems), and an athletic field with infrastructure for recycled irrigation water. By simply moving through the thoughtfully designed series of courtyards, trails, recreation and gathering places, students, faculty, families and visiting community members will know a sense of place that causes us to belong, to take ownership and to care.